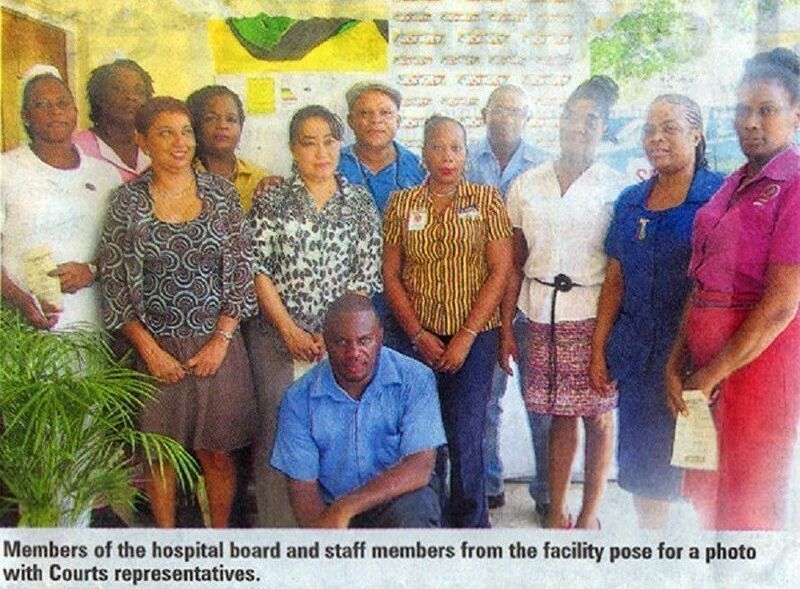 Dennis Harris, managing director of Unicomer (Jamaica) Limted leads from in front as he participated in Labour Day activities at the Port Maria Hospital Accident and Emergency Unit. 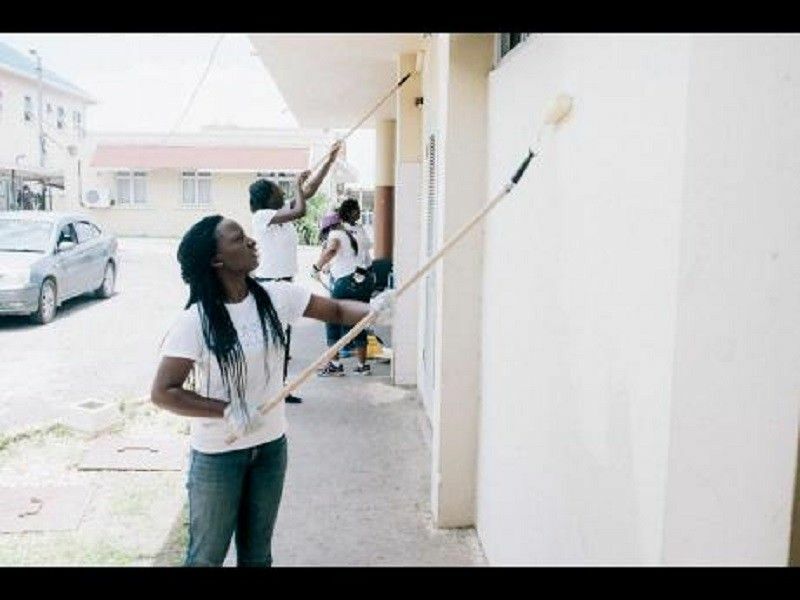 Unicomer volunteers are hard at work applying paint to the exterior walls at the St Ann's Bay Accident and Emergency Unit on Labour Day. 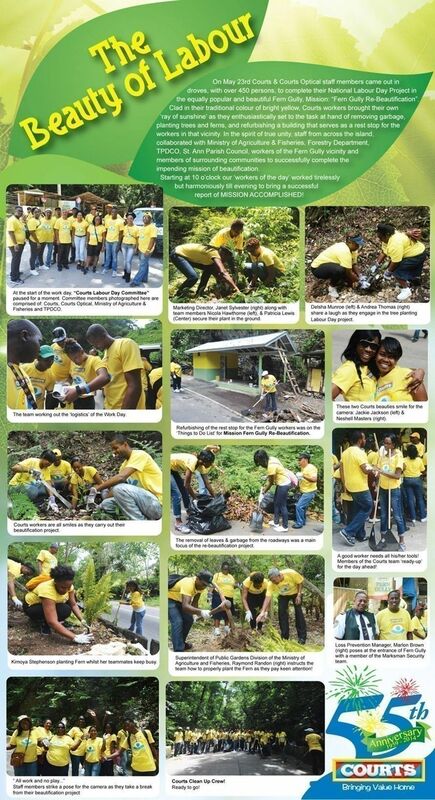 Unicomer (Jamaica) Limited (Courts Jamaica) mobilised an islandwide network of more than 100 volunteers on Labour Day. The team assisted with transforming the Accident and Emergency units at the Bustamante Hospital for Children, Port Maria, St Ann's Bay and Spanish Town hospitals. This was in keeping with the theme for Labour Day, 'For Health's Sake ... Keep It Clean'. "The Labour Day committee was actively scouting projects long before the national theme was announced. We were very delighted to know that the planned activities were in keeping with the theme. 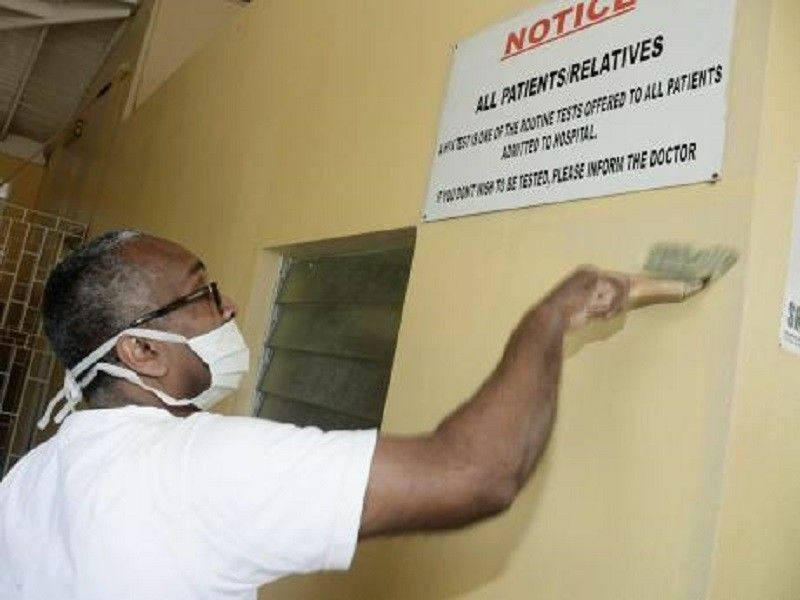 We were able to paint the units at these hospitals, provide air-conditioning units at the Spanish Town Hospital and Bustamante Hospital for Children, and refurbishing cabinetry at the St Ann's Bay trauma bay," stated Renae McKenzie, public relations officer at Unicomer (Jamaica) Limited. She said that after Labour Day, the company's input extended until the end of the week. "Much-needed signage at the units are being installed as well as the Port Maria Hospital benefiting from signage on the roadway that was previously destroyed," she said. "Nebulising units have been ordered for all the accident and emergency units and will be delivered within the next three weeks." Dr Mara Hosang of the Bustamante Hospital for Children expressed her gratitude for the initiative spearheaded by Unicomer and said the department looked brighter after the work. 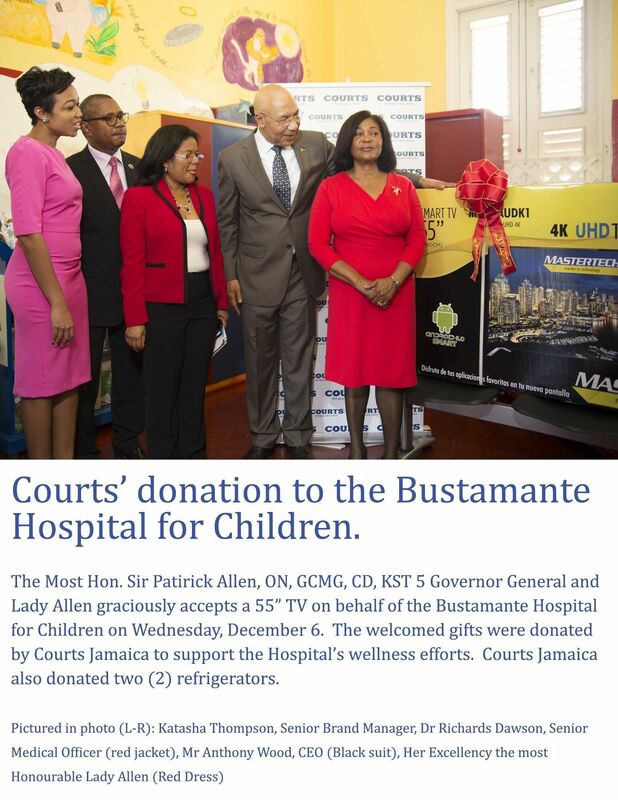 She added that the installed AC units would assist greatly in the hospital's asthma treatment room. 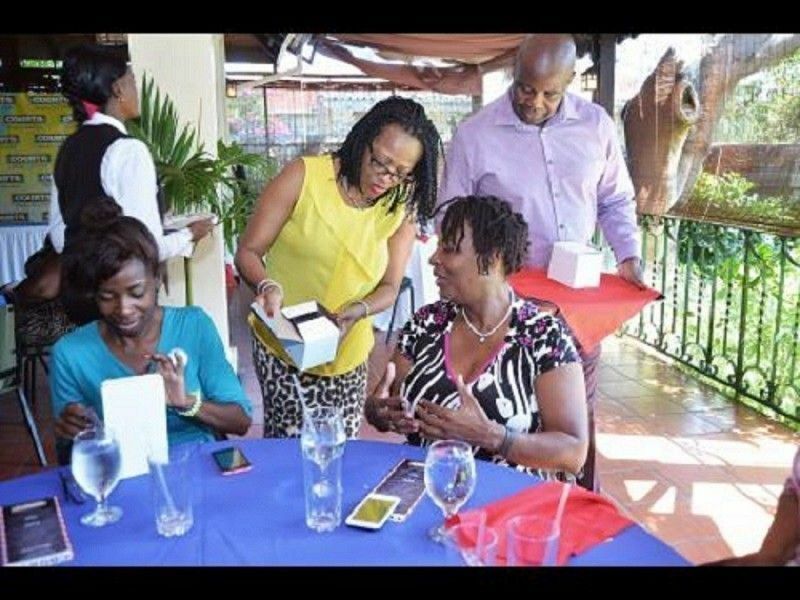 Debbie Rowe (second left), merchandising officer at Courts Jamaica, and her colleague Geaton Porter, presents St Aloysius Primary vice-principal Marcia Pitter (right) and her assistant, Pamela Pitter, with their tokens during a luncheon on Teacher's Day. 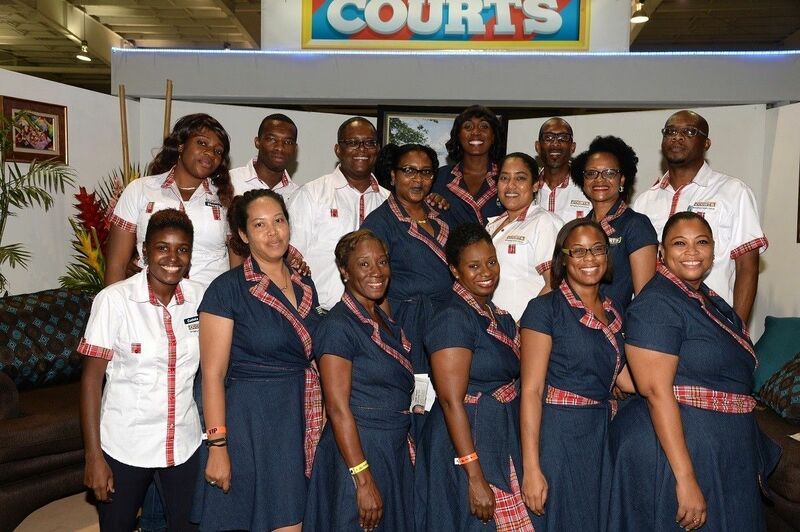 Courts Jamaica fÍted educators and other staff from three schools, one per region, on Teachers' Day, May 4. St Aloysius Primary (eastern region), Santa Cruz primary and Junior School (western region), and Jericho Primary School (central region), were the selected institutions. 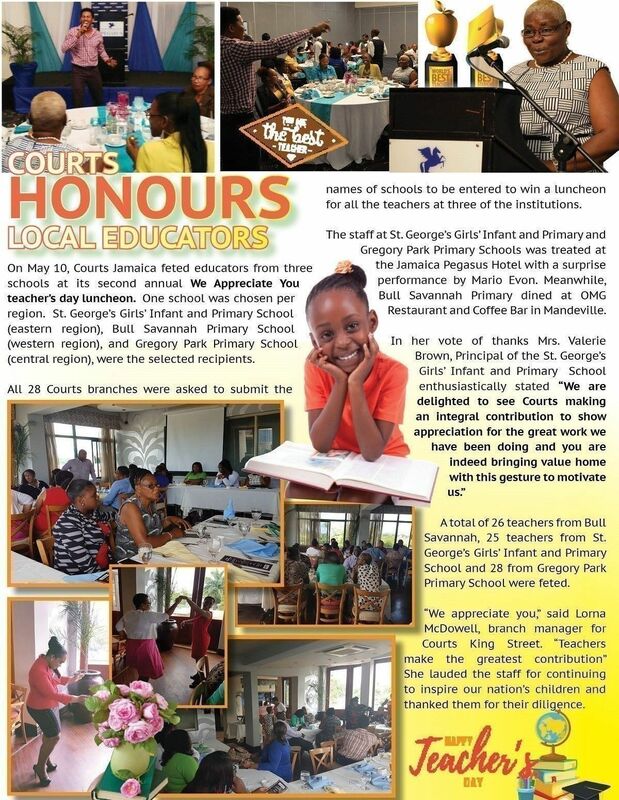 All 28 Courts branches were asked to submit the names of schools to be entered to win a luncheon for all the teachers at three of the institutions. 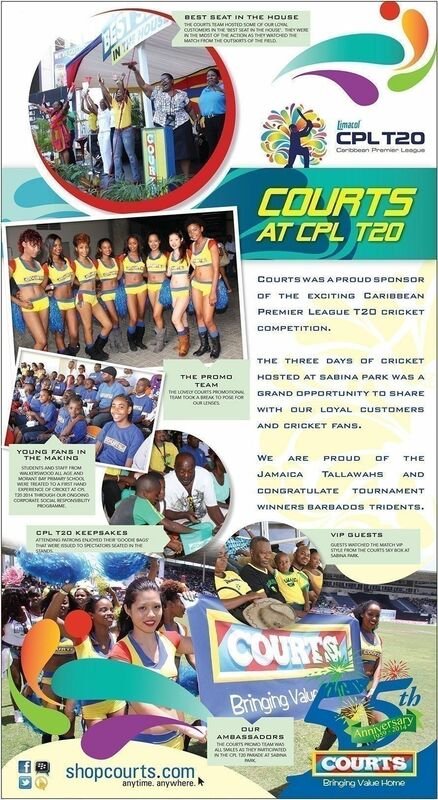 Courts Jamaica then drew the names from the respective regions and called the winning schools to organise the treat. The staff at St Aloysius were treated at Alhambra Inn, where, ironically, principal Althea Palmer had been making plans to take her hardworking team. "We feel blessed and treasured," said Palmer. 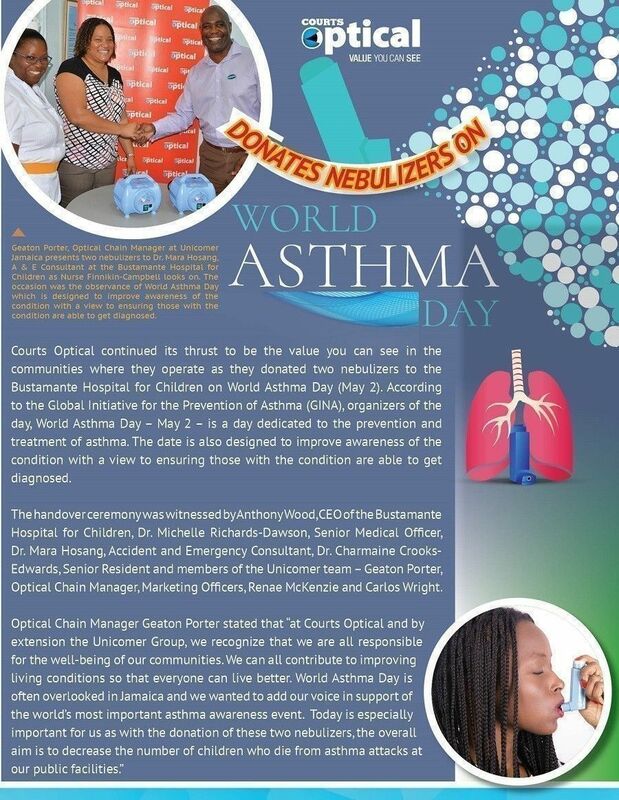 "It shows that corporate Jamaica cares. We are honoured." Of the three schools, St Aloysius had the largest staff complement, with 54 individuals turning out to be treated. 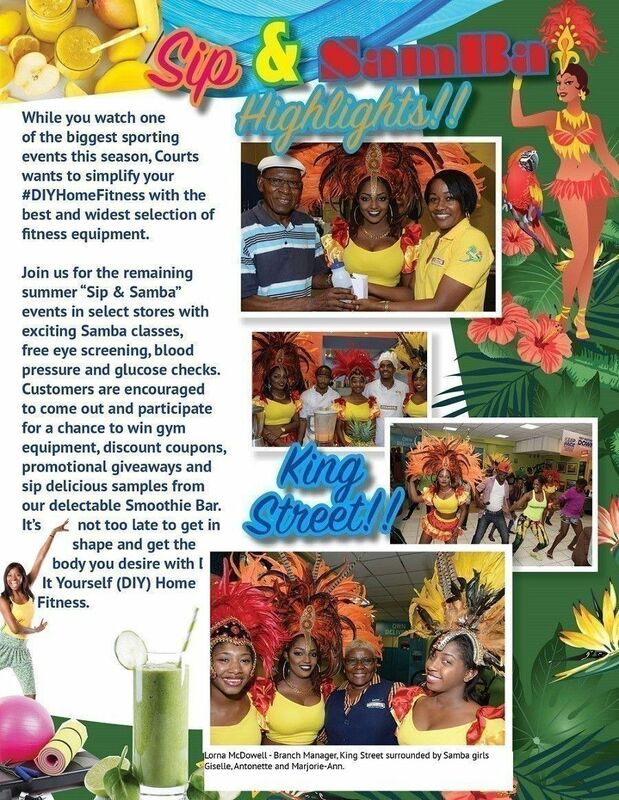 The Duke Street-based school is very popular in the Corporate Area, especially with families from downtown Kingston. "We call our school 'the oasis of the inner city'," said Palmer. "We are very sought-after. We do very well and we hope to continue that." 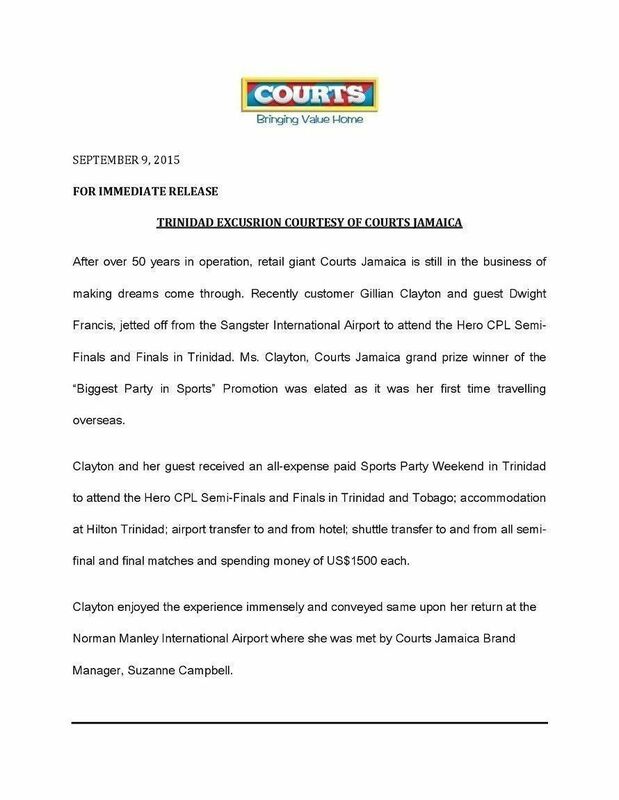 Teachers were shuttled to the venue, treated to fine dining, and then presented with Courts Jamaica tokens. Twenty-six teachers from Jericho Primary and 28 from Santa Cruz were also fÍted. "We appreciate you," said Kimberly Bonner, administrative manager for Courts King Street bargain centre. 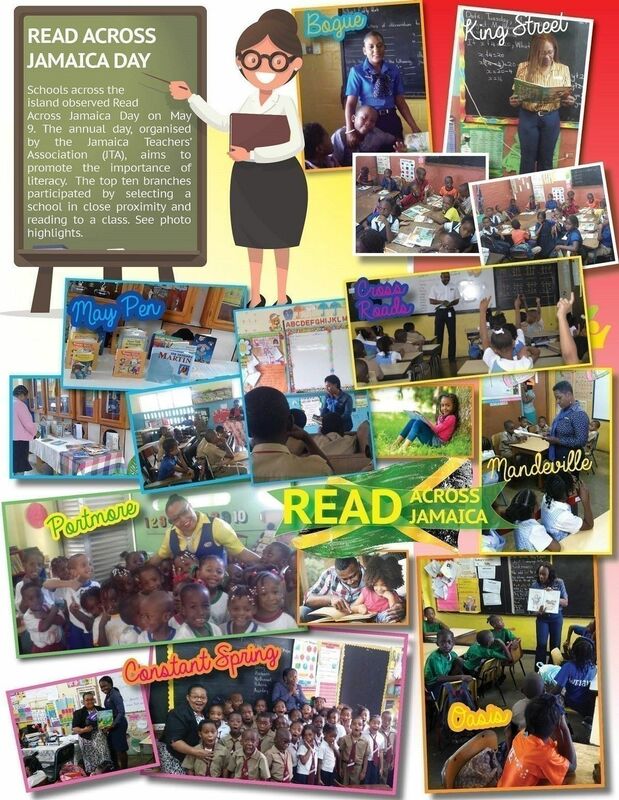 "Teachers are regarded as the backbone of Jamaica." She lauded the staff for helping to build the character of students, thus aiding the positive development of society. 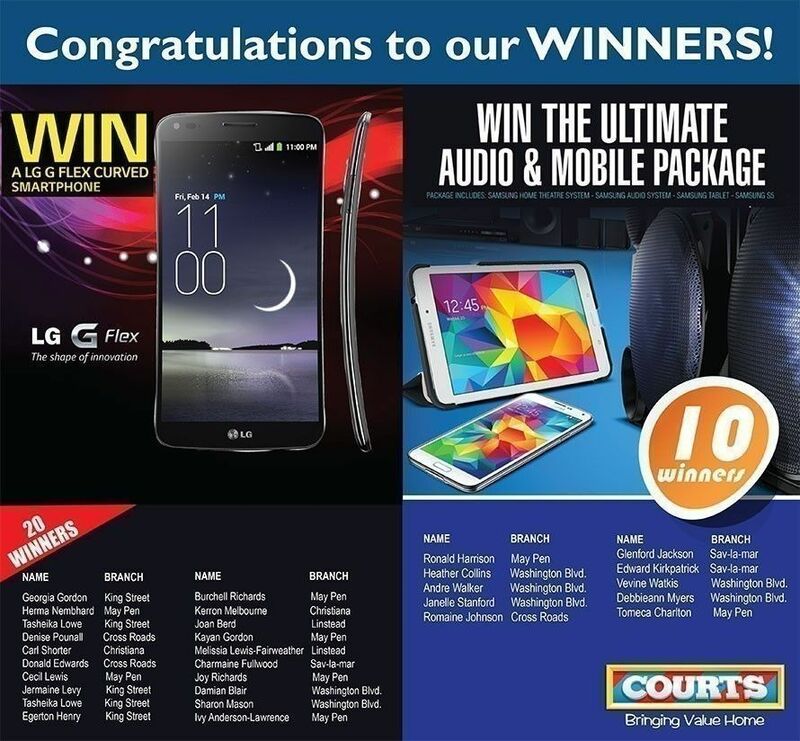 At all three events, one staff member won an Alcatel tablet. 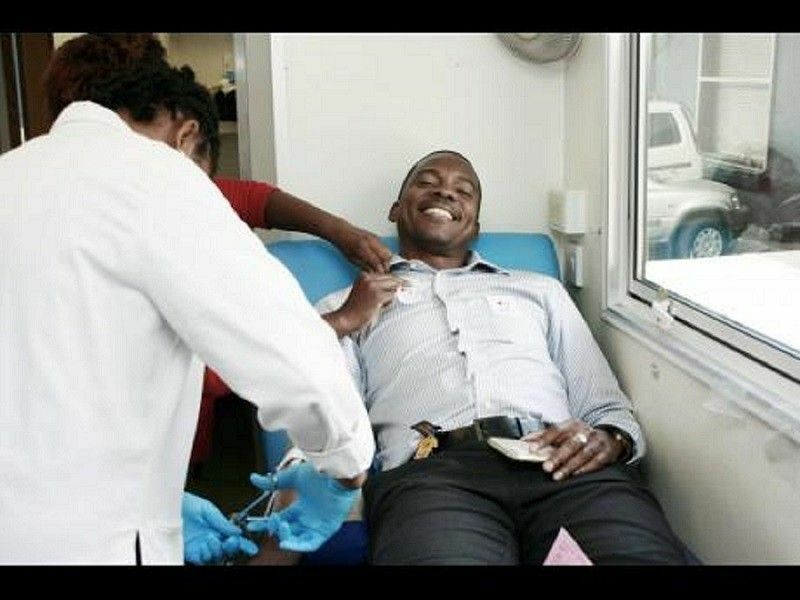 Duval Whyte, assistant IT manager at Unicomer (Jamaica Limted is all smiles as he participates in a blood organised as part of the Unicomer Volunteer Week activities recently at Courts Cross Roads. 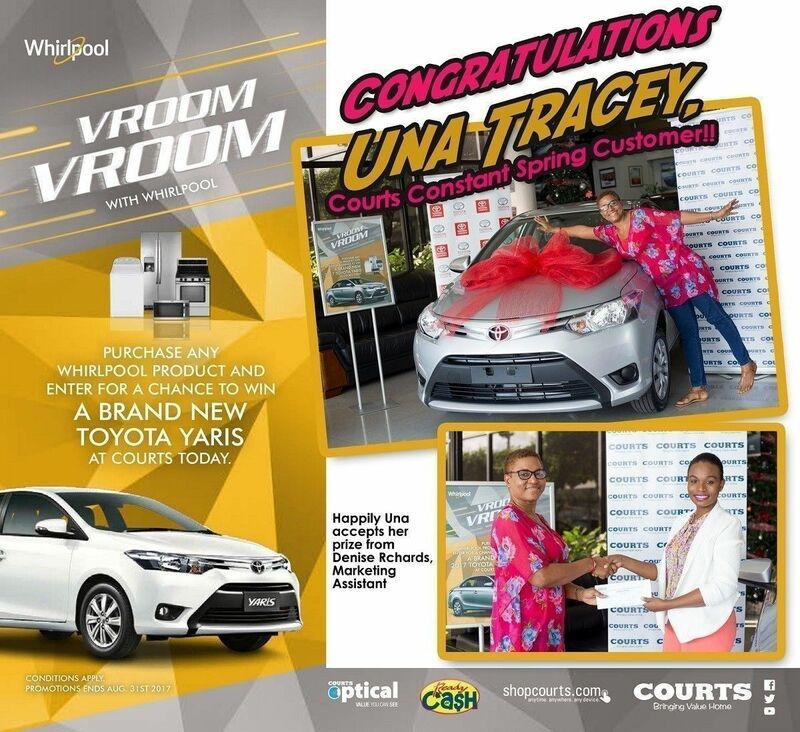 Unicomer Group, of which Courts Jamaica is a part, recently celebrated Volunteer Week, and more than 120 team members in Jamaica were given the opportunity to participate. 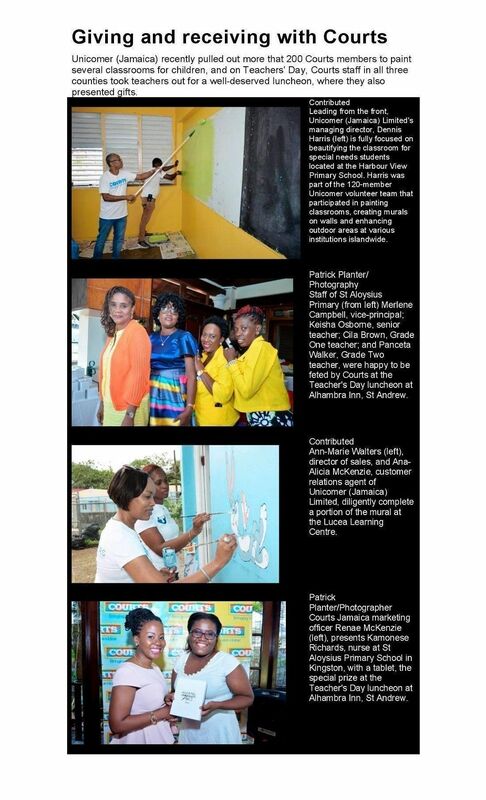 The volunteers painted classrooms, created murals, and enhanced outdoor and play areas at the Montego Bay Autism Centre and the Harbour View and Lucea learning centres. These institutions all cater to special-needs children. The assistance came at a very fitting time, when Autism Awareness Month is observed. In addition, staff members participated in a blood drive at the Courts Cross Roads store in support of the Blood Bank. "Over the years, volunteerism has become an increasingly important element of the Unicomer culture. It is about choosing to give of our time, energy, and skills in order to make a difference in the lives of others, while, at the same time, strengthening the relationships with the communities within which we operate," said Dennis Harris, managing director of Unicomer (Jamaica) Limited. "Some of the areas where our team continues to demonstrate the true meaning of volunteerism are by supporting various activities and programmes in the areas of education, community development, health and sports. Some of these are now embedded in our core social-commitment activities and form part of our annual calendar of events," he added. 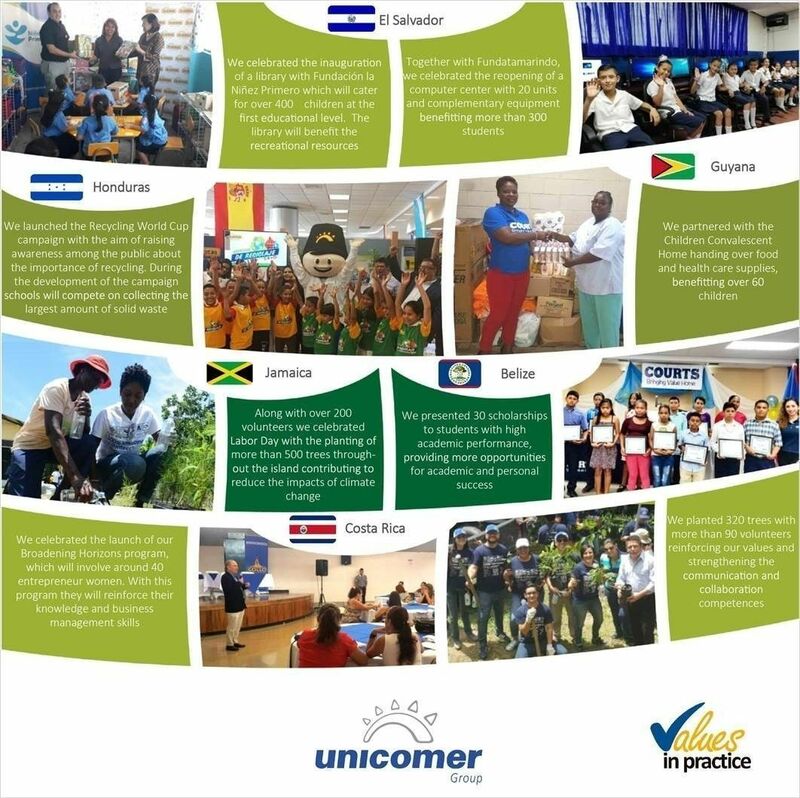 The Unicomer Group has always prioritised contributing to the wider communities within all of its territories. The group strives to positively impact the sustenance of a better world and create equal opportunities for everyone. 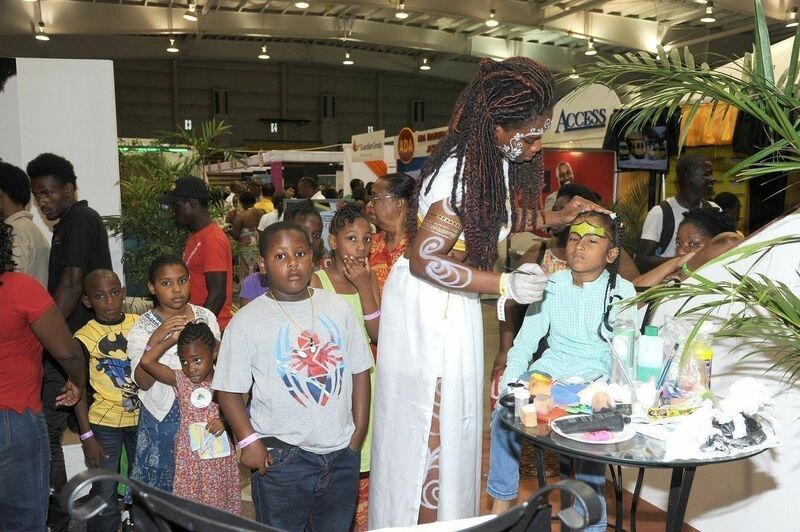 Expo Jamaica, the Caribbean’s premier trade exposition was held April 14-17, 2016 in Jamaica’s National Arena & National Indoor Sports Centre. 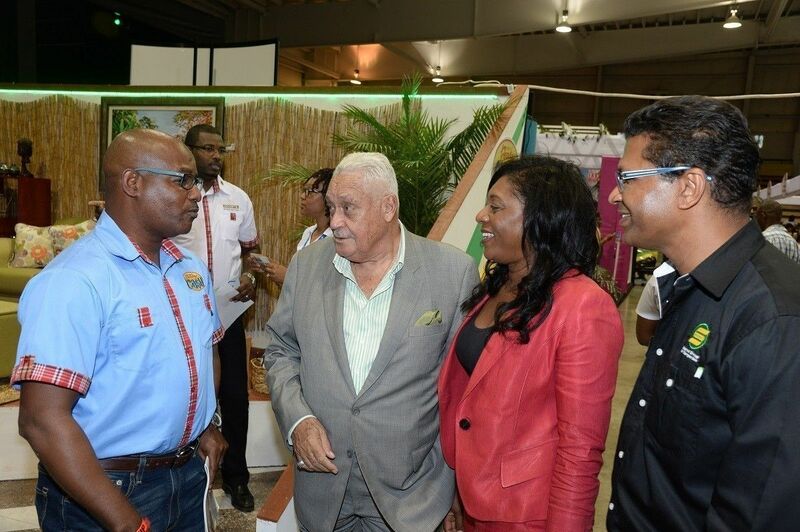 For four days, Kingston, Jamaica, became the hub of regional and international trade, with hundreds of manufacturers, exporters, buyers, distributors and wholesalers meeting in one setting, to explore business opportunities and transact trade. 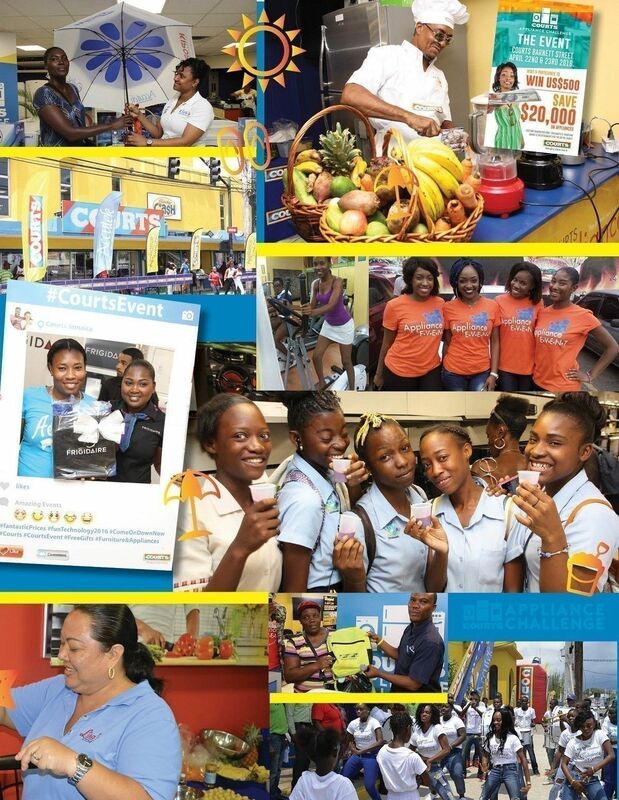 Courts is proud to be a strong supporter of the Business Hub of the Caribbean by carrying locally manufactured products that continue to succeed in our stores because they understand the needs of our customers. This is encouraging news for the country’s manufacturing sector; the love affair between Jamaicans and locally-made furniture pieces shows no sign of fading. As part of our continuing efforts to support local manufacturers we showcased a number of locally made products at our booth. 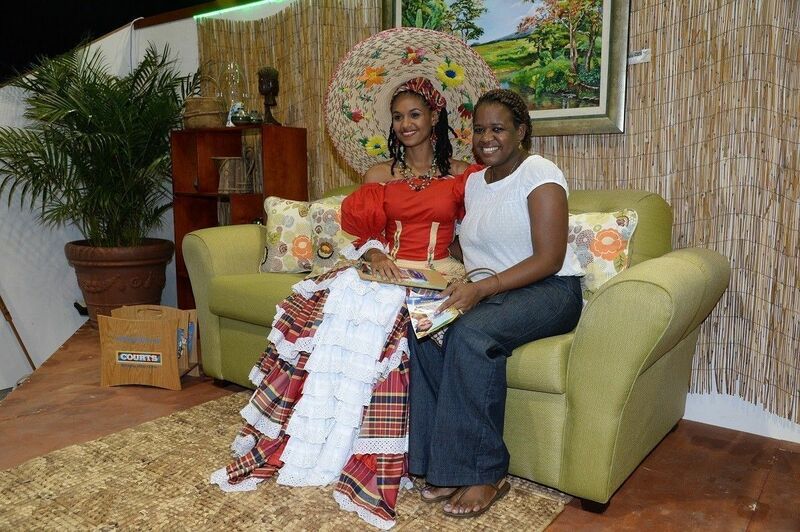 In addition, we hosted the reigning Miss Jamaica World, Dr. Sanneta Myrie at our booth who signed autographs. 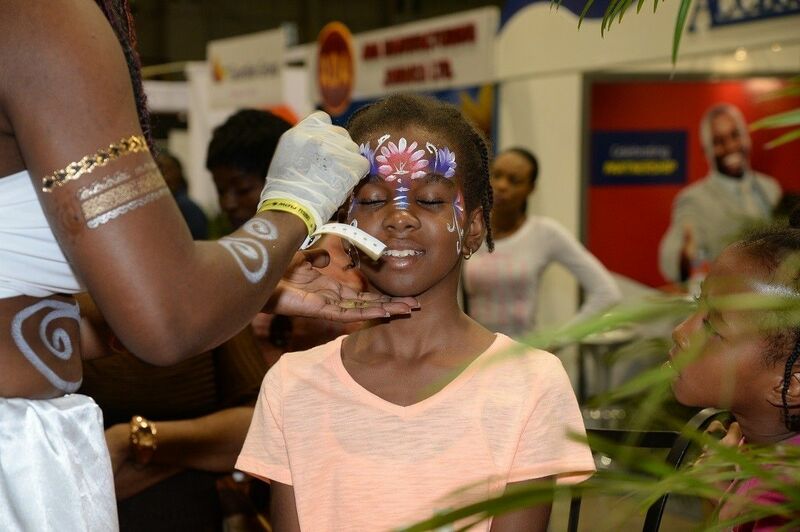 Face painting for the children was a welcomed addition that had the little ones and their parents flocking to our booth. See highlights from the event. From left: Charline Patterson, Glendon Lowe( Courts Fairview Branch Manager) and Jacqueline Edwards-Locke are all smiles for our camera. 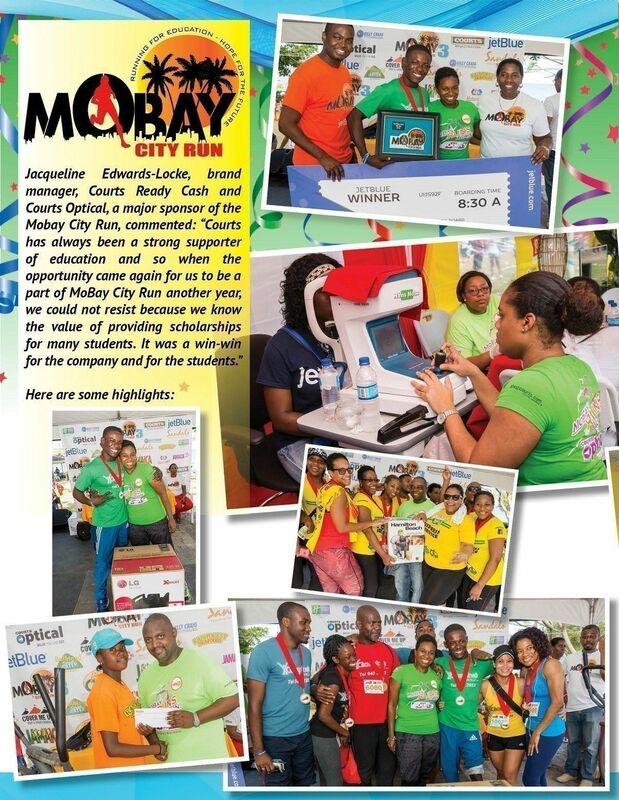 The top female and male winners of the third staging of the MoBay City Run 10K/5K Run and Walk, will win a trip to any JetBlue destination courtesy of the North American carrier, as part of their prize package. JetBlue for the second year, has agreed to be the official airline of the event, which has become a marquee in the tourism capital. 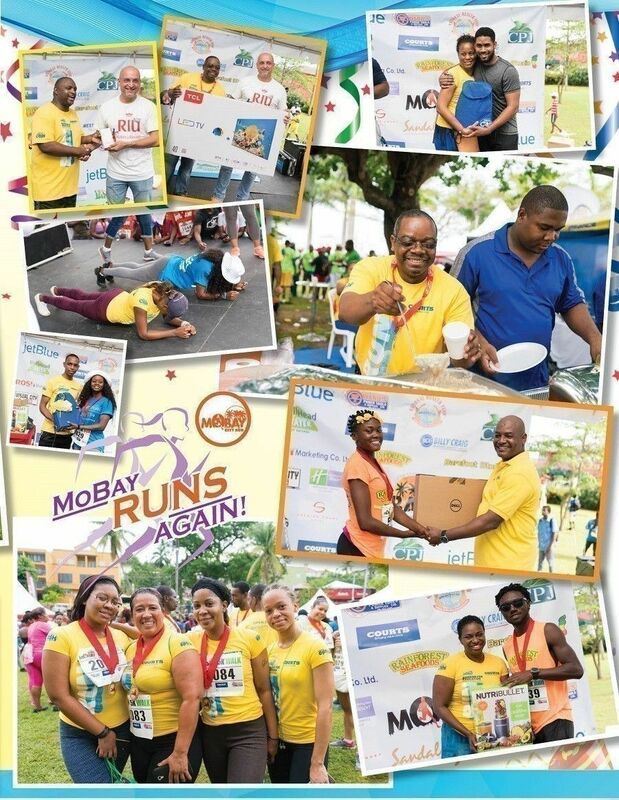 Airline tickets, cash, television sets, appliances, weekends and dinners are among the number of prizes that participants will have access to on Sunday, May 1, when the event bearing the hashtag, #MoBayrunsagain, takes over the second city streets, says logistic coordinator, Nicole Allen. 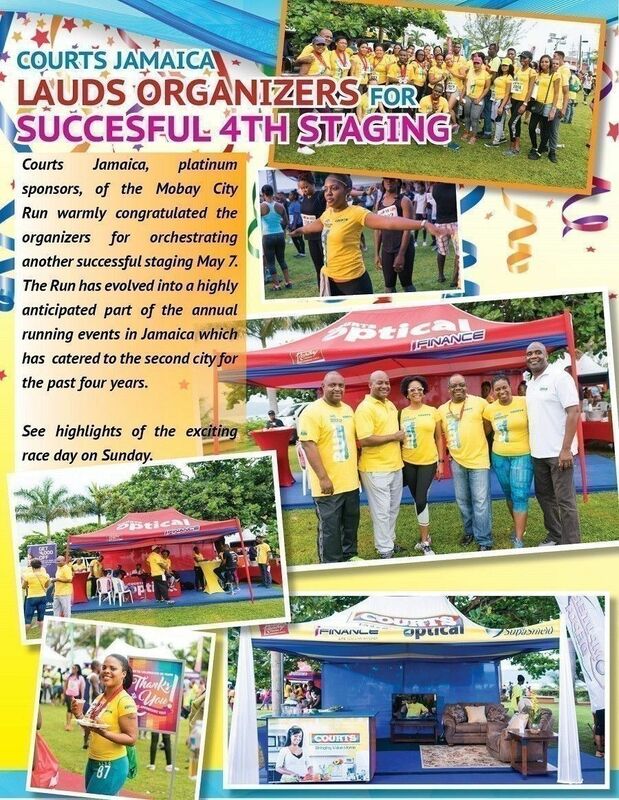 During the official launch at the Holiday Inn in Montego Bay on Tuesday, Allen notes that in fact, participants will take home far more attractive prizes than any other year. Her comments were bolstered by Courts (Unicomer's) marketing manager, Jacqueline Edwards-Locke, who has placed three of her brands behind the charity that assists struggling tertiary students to remain in university. 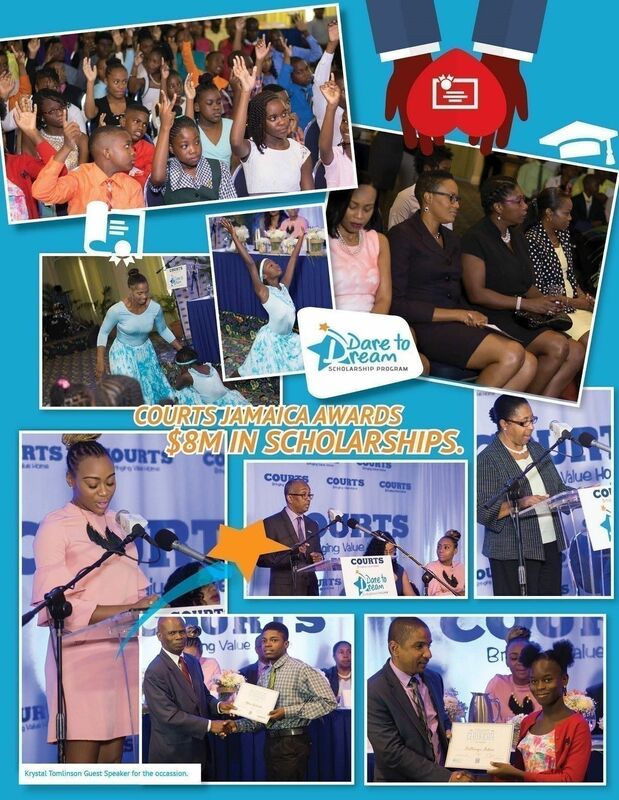 Edwards-Locke revealed that Courts was investing $1 million in cash and prizes to the event. "We will donate $100,000 towards sponsoring students who wish to participate, in addition to gifts of two television sets, two exercise equipment, possibly a bicycle or elliptical and a Sony music system." 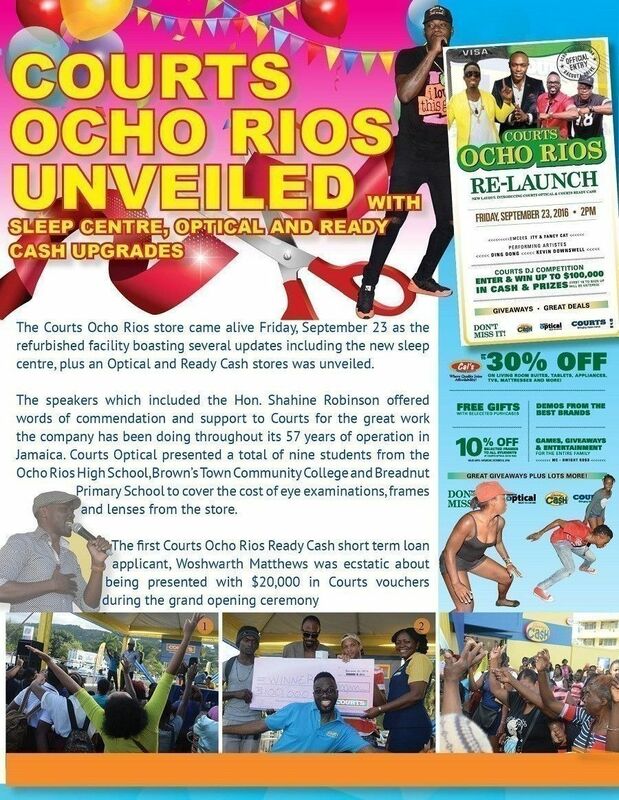 Courts will also man three booths at the Old Hospital Park race venue, offering free eye screening, blood pressure checks and a host of other activities on the day of the run. 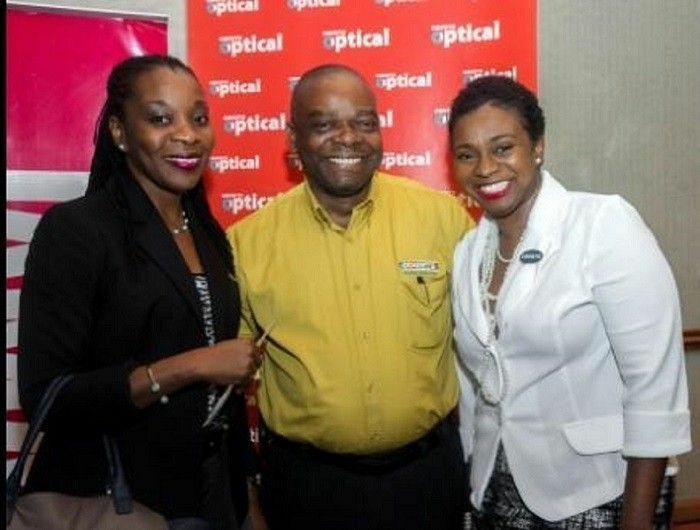 Oscar Kerr (left), branch manager, Courts Constant Spring branch, has something to smile about with Moya Chong-Sang (centre), Jamaica Money Market Brokers Money Transfer grand prize winner’s proxy and Sharon Gibson, general manager, at the presentation which took place recently at the Courts location. 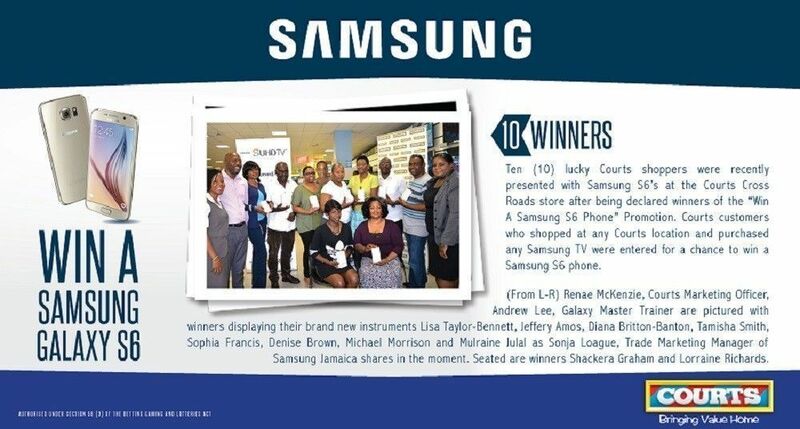 Chundey Heywood will be able to furnish her living room, having won the grand prize in the Jamaica Money Market Brokers Money Transfer (JMMB MT) promotion. 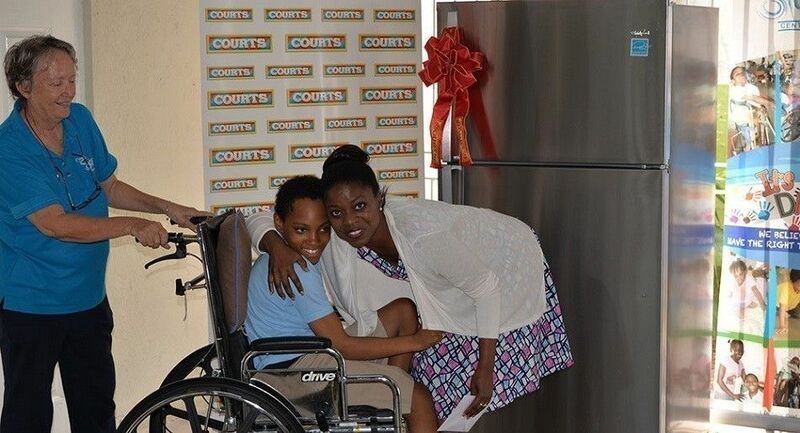 She won a room make-over, valued at up to J$250,000, from Courts Jamaica (Limited) courtesy of JMMB MT. After hearing the good news, Heywood said, "I feel very excited and blessed to start off the New Year as a winner. This is a great surprise for me because I was in the process of trying to furnish my newly built house, and my living room was my next project for this year." With this start, Heywood said she can now focus on outfitting the other rooms, including her bedrooms. The repeat JMMB MT client explained that her good fortune was influenced by her dislike for joining lines during the holiday period. JMMB Money Transfer gives me the option to receive my money from overseas with the deposit in my bank account, and I feel safe about my money because I receive text messages and emails when the transfer arrives," she said. The promotion, which ran between November 16, 2015 and January 2, also awarded 14 parish prizes of a tablet to each winner. 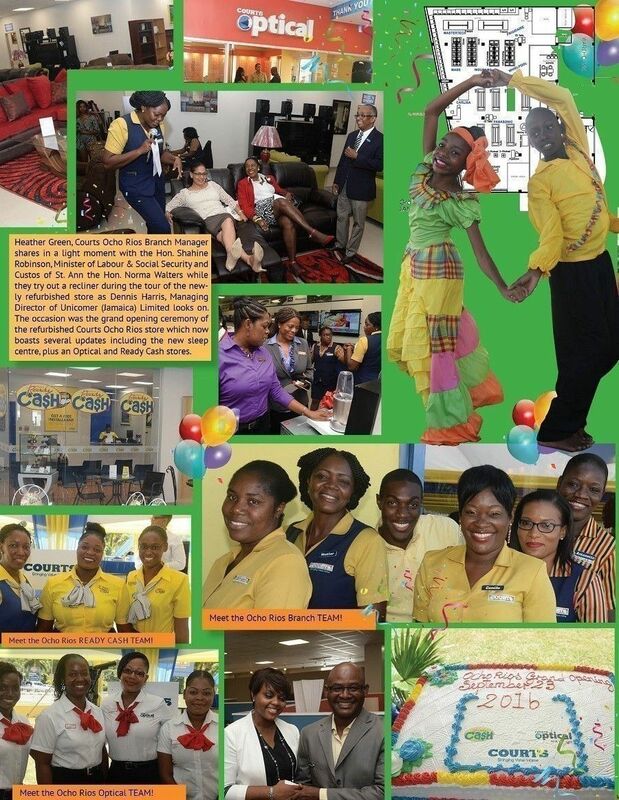 The winners of the promotion were randomly selected from clients who received either intra-island or inbound transactions from any of JMMB MT's eight overseas remittance partners or 46 intra-island agents during the promotional period. Sharon Gibson, general manager at JMMB MT, said they were happy to reward their clients in this way, while thanking them for choosing the institution as a remittance partner. JMMB Money Transfer, though a smaller player in the local remittance market, provides several options for individuals to send money to Jamaica, via its international partners, from over 80 countries worldwide including: Europe, The Bahamas, United Kingdom, USA, Canada, Curacao, St Maarten, and Aruba. 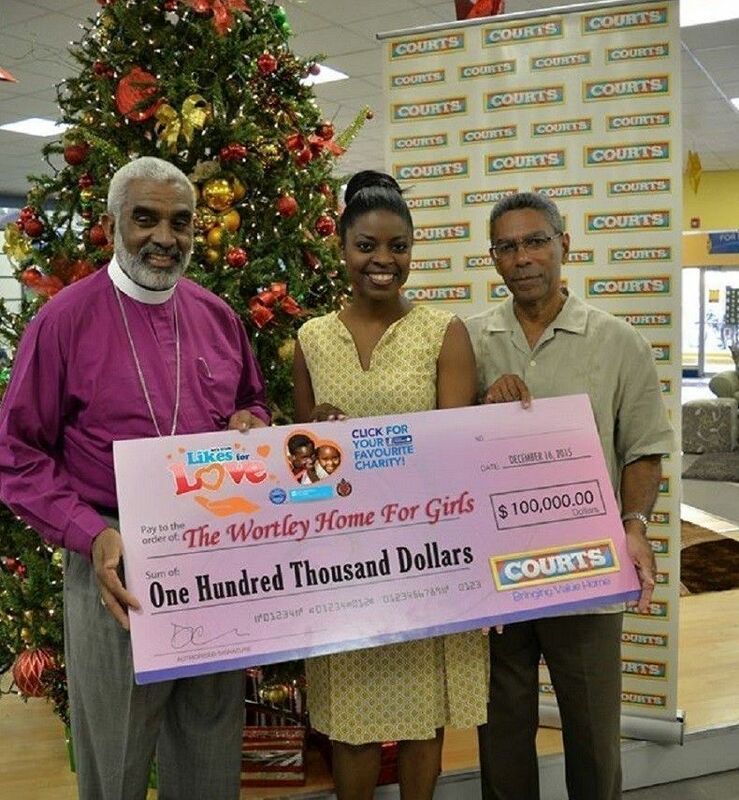 Suzanne Campbell, Brand Manager, is flanked by Reverend Robert Thompson (left) and Chairman Keith Sangster of The Wortly Home for Girls. 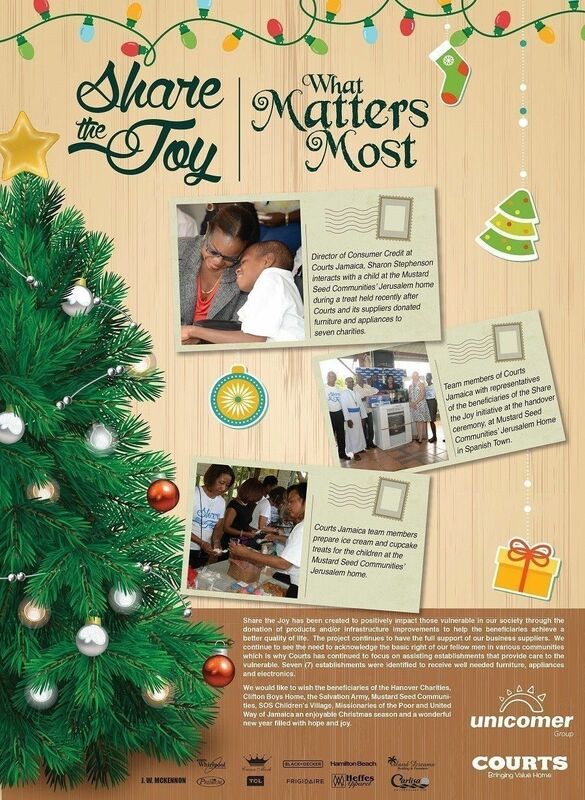 The SOS Children's Village has come out winners in the Courts Jamaica 'Love for Likes' Facebook competition. 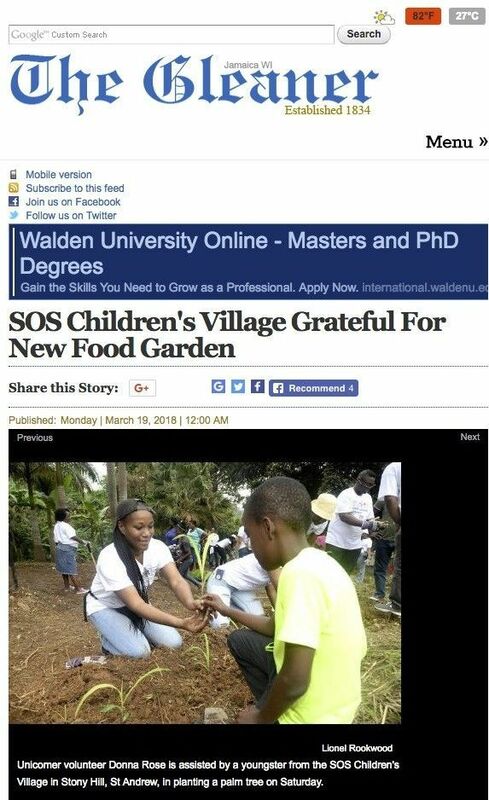 SOS Children's Village, The Wortley Home and Food for the Poor, allowed Courts Jamaica to use their charities to drive traffic to the Courts Facebook and Twitter pages for two months, by employing the Love for Likes campaign. 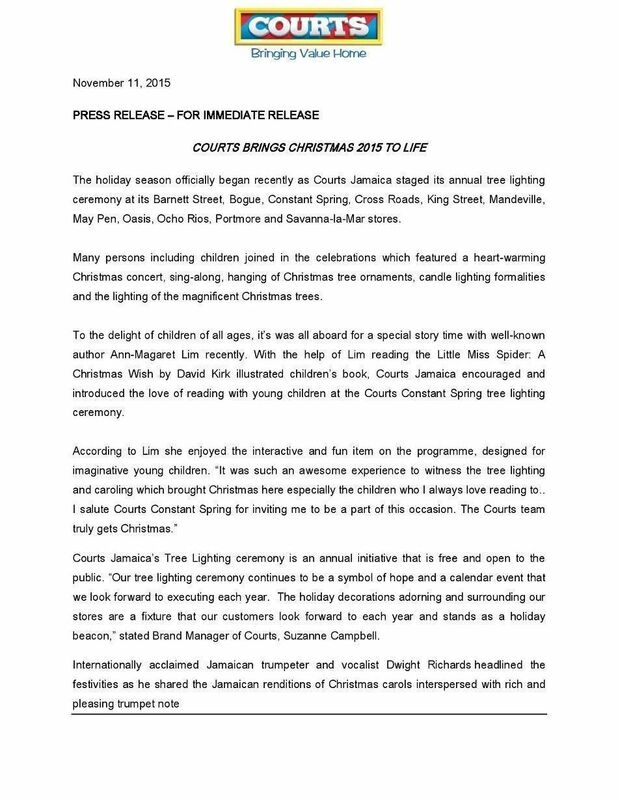 Persons who were interested in supporting the three proposed charities were asked to 'like' the Courts Jamaica Facebook page and then vote for their favourite charity for funds to be donated to them. The initiative ran from September 28 to November 27, 2015. 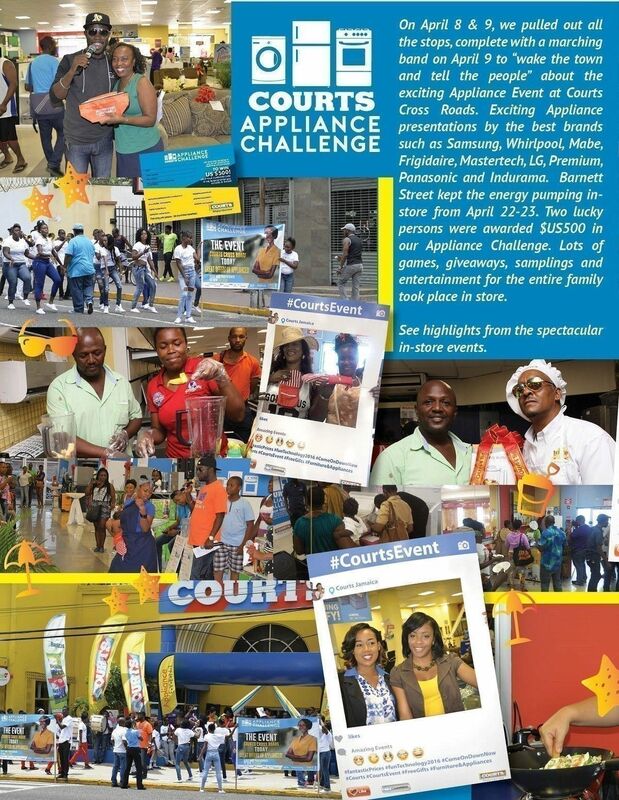 The Courts Jamaica social media following grew from 92,269 fans in September to 97,153 in October, and then further increased to 101,922 in November. At the end, SOS Children's Village received the most feedback with 645 votes, followed by The Wortley Home for Girls with 512 votes and Food For The Poor with 437 votes. The presentations were made to the organisations recently. 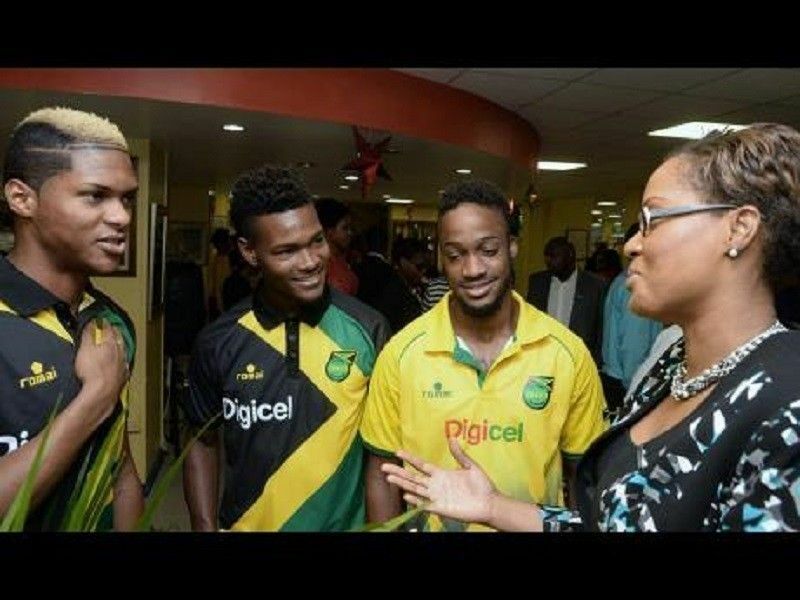 Courts Marketing Director, Janet Sylvester (right) listens keenly to senior Reggae Boyz (from Left) Andre Clennon, Kevaugn Frater, and Junior Flemmings. This was at a panel discussion hosted by Courts to discuss children in our society on the recognition of Give a Child Your Heart Day. 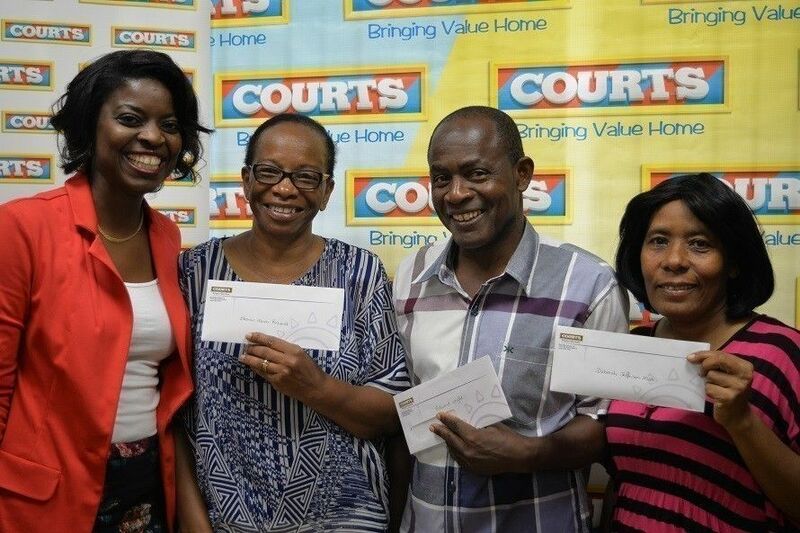 Courts, in collaboration with its suppliers, presented more than over $1.7 million dollars worth of goods to four homes for the elderly last Wednesday, November 18. The presentation ceremony was held at the St Monica's Home for the Abandoned Elderly. "This annual initiative began last year with a focus on children. This year, we decided to focus on the elderly in our society as another vulnerable group, and so today, the St Monica's Home for the Abandoned Elderly, the Golden Age Home, the Harrison Memorial Home for the Aged and the Hyacinth Lightbourne Visiting Nursing Service received much-needed furniture, appliances and electronics," said Dennis Harris, managing director of Unicomer (Courts Jamaica) Limited. He further explained, "This is a regional initiative that will be reaching nearly 800 elderly persons across Trinidad, Jamaica and Belize this year. We see the value in honouring those who have contributed immensely towards the growth of our communities and, by extension, the country as a whole, through the giving of themselves and all they have offered throughout their younger years. We never take our responsibility lightly and this has been the driving force behind our 56 years as furniture and appliance market leader in Jamaica." Speaking on behalf of the participating suppliers, Omar Azan of Boss Furniture congratulated Courts Jamaica on the bold move to continue supporting community initiatives that bring value home. 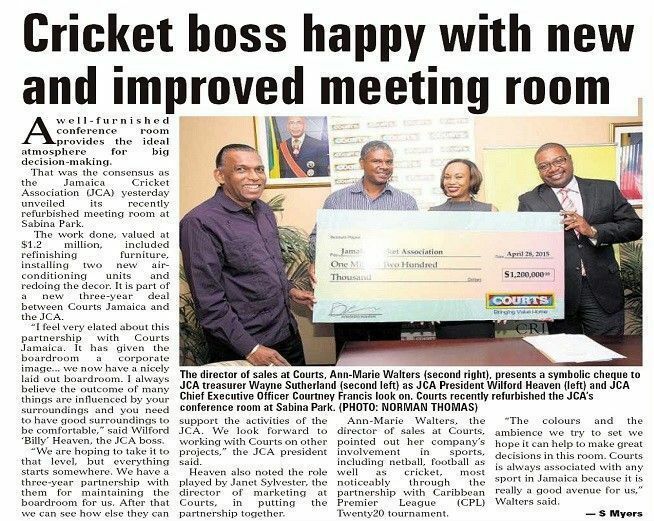 "Boss Furniture and the other suppliers were eager to lend support to this initiative because Courts Jamaica continues to assist institutions that support Jamaicans," he said. "We do hope that our collaborative effort today will create some more happy people at these four homes." Dining tables, televisions, washing machines, mattresses, fans, microwaves, and refrigerators were among the items donated by Acer, Andy Zhou, Asialat, Boss Furniture, Carlisa Enterprises, Electrolux, Hamilton Beach, Heffes, Island Dreams, JW Mckennon, Leodor Furniture, Precision Trading, Spectrum Brands and Therapedic Foam, Winty's and Zuriel. 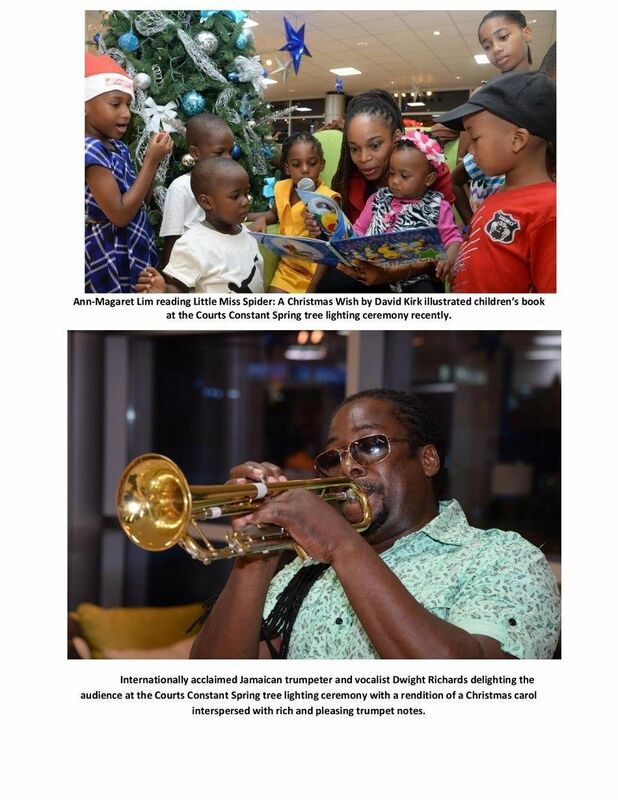 Hermine Bascoe, manager at the St Monica's Home, expressed her gratitude on behalf of the management, staff and residents of the four homes, noting that the items come at the beginning of the Christmas season to bring cheer and glad tidings. 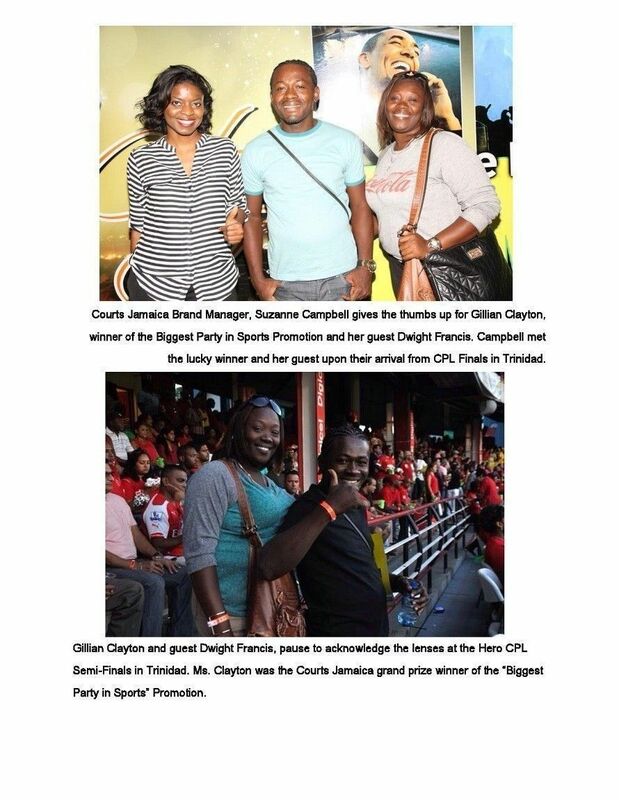 Suzanne Campbell, Brand Manager of Courts gives Gianni Vassell, the S.T.E.P. Centre student a hug after receiving a thank you card as Hilary Sherlock, Principal looks on. The occasion was the donation of a 22 Cu. Ft. Whirlpool refrigerator by Courts to the Centre for the canteen. 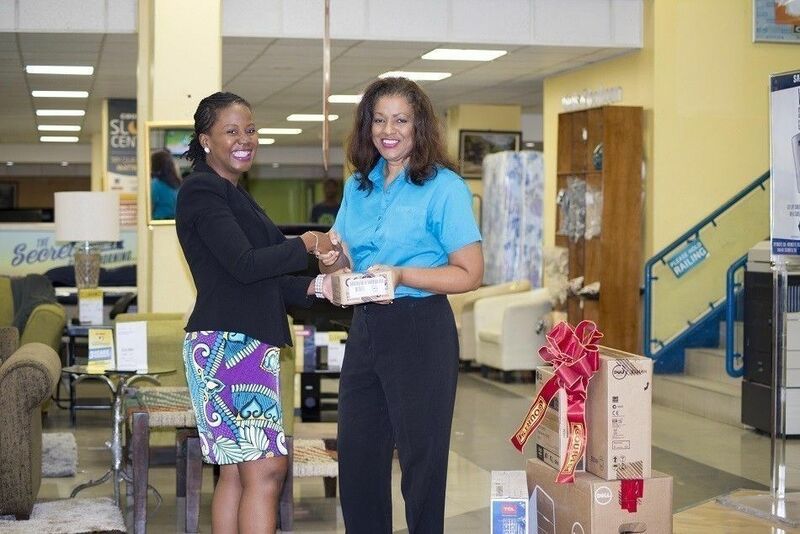 Courts Jamaica Marketing Executive, Renae McKenzie makes presentation to Mrs. Lurlene Less, Executive Chairwoman of the Diabetes Association of Jamaica. 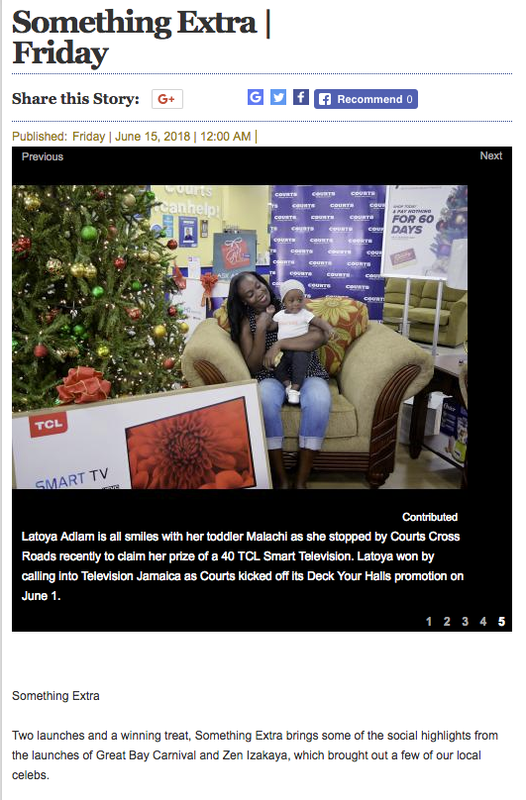 Courts Jamaica donated a DELL desktop computer, TCL Television and LG DVD Player recently to the organization at the Courts Cross Roads Branch. 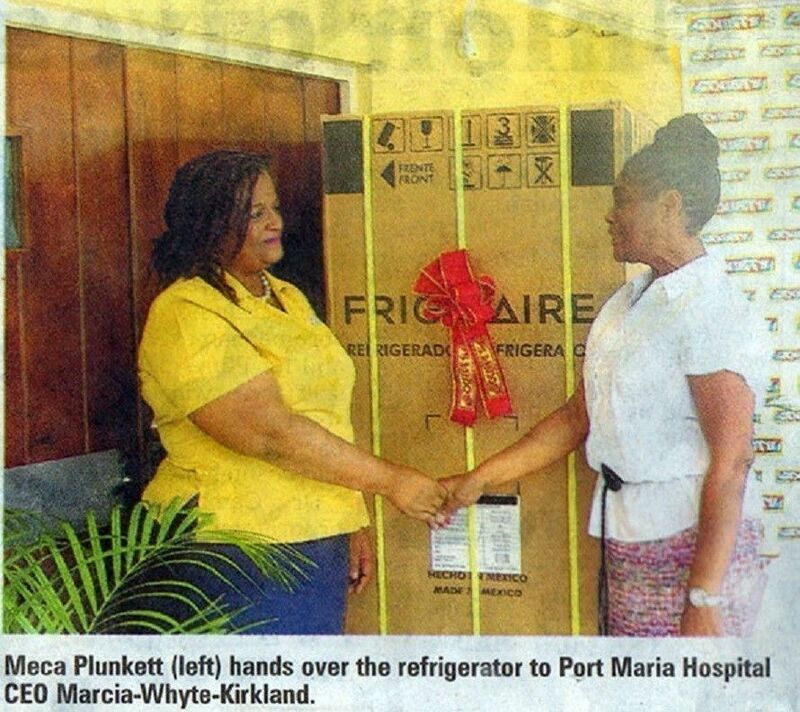 Doctors at the Port Maria in St. Mary should be a little more comfortable while on duty after Courts donated a refrigerator to their station. “We are really happy; this was needed like from last year,” said Chief Executive Officer Marcia Whyte-Kirkland. Noting that it is a much welcomed gift, Whyte Kirkland said it will certainly be beneficial to the doctors. “I really want to thank Courts again. 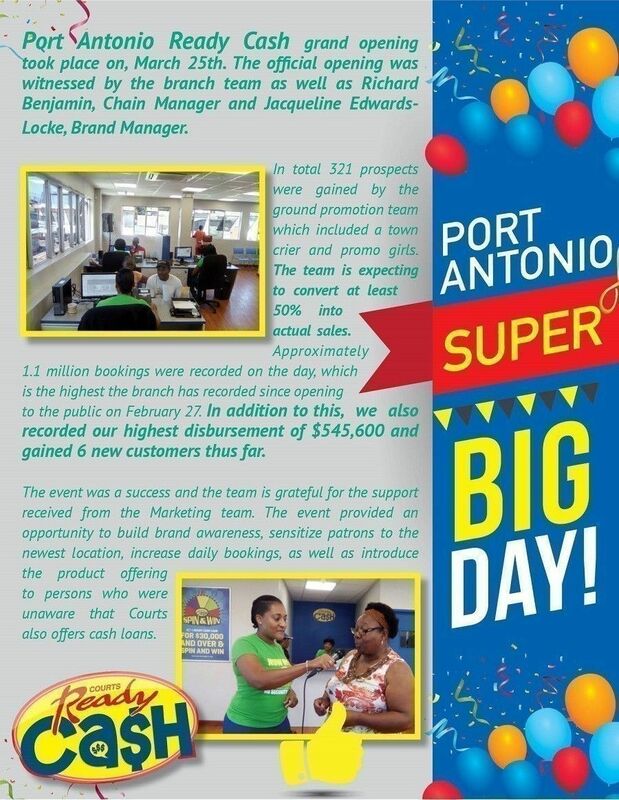 It’s nice to know that Corporate Jamaica is on board with us,” she said. Branch Manager of Courts Port Maria Meca Plunkett said the company was happy to make the doctor’s quarters a much more comfortable area. Plunkett said Courts decided to assist the hospital after deputy chairman of the hospital board Evon Hewitt approached the company. Unicomer Jamaica Limited has signalled its confidence in Jamaica’s economy with yesterday’s (October 8) opening of its multimillion dollar upgraded distribution centre at its Twickenham Close location in Kingston. The renovation and expansion project, which represents an investment of over US$8 million, is expected to generate improved efficiencies in the operations and the movement of inventory by the furniture, appliances, and electronics companies, which Unicomer operates in Jamaica. Industry, Investment and Commerce Minister, Hon. Anthony Hylton, in his remarks at the opening ceremony, said the expansion and renovation project is testament to the private sector’s belief in the Government’s growth strategy. “This specific investment is taking advantage, not just of the improved business climate, but of the country’s improved physical infrastructure, which is critical to enhancing internal logistics,” he noted. Minister Hylton said he is hoping that the centre’s unveiling will become a precursor to the development of a regional distribution centre in Jamaica. “It is useful to note that the implementation of the National Export Strategy and efforts to improve our trade facilitation regime will facilitate Jamaica’s use as the distribution centre of the region. This, as our improved Government processes will facilitate ease and transparency in distribution operations,” he said. He noted that with the improvements, Unicomer has also positioned itself to take advantage of the many benefits to come from the Jamaica Logistics Hub initiative. 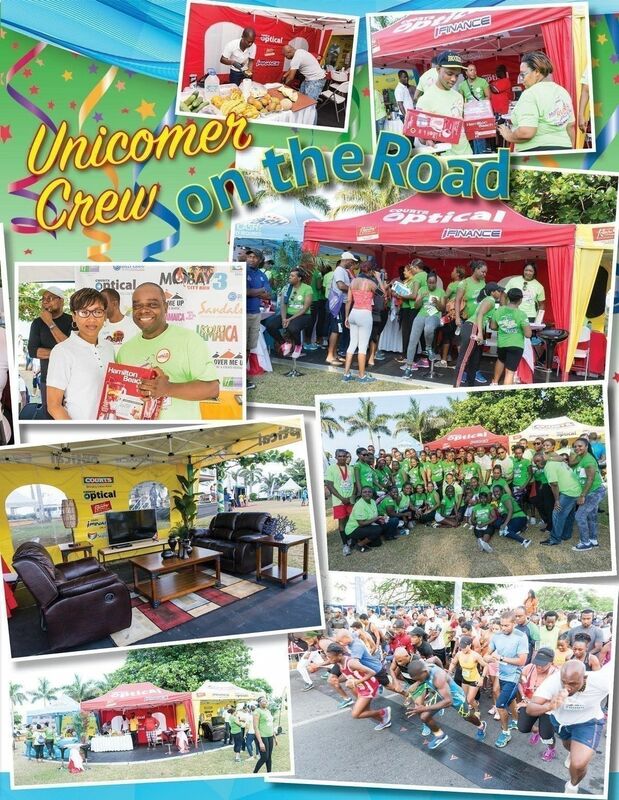 Managing Director of Unicomer, Dennis Harris, informed that the distribution centre employs over 100 persons and an additional 50 persons in the peak season. He said the company has also invested US$1.3 million in the installation of solar energy solutions at its stores at Constant Spring, May Pen, Cross Roads, Linstead, Portmore, Mandeville, and at the distribution centre. “We will be producing approximately 1.3 million kilowatt-hours of power per year from our solar installations. This will cover up to 90 per cent of the power needs at certain locations,” he noted. The distribution centre was blessed by the Very Rev. Msgr. Gregory Ramkissoon of the Mustard Seed Communities. The project, which started sometime in 2014 and took 18 months to complete, includes warehouse extension; construction of a guardhouse, electrical area, garbage house, kitchen and bathroom; renovation of warehouse storage facility; road, drainage, and sewer works; and the building of a retaining wall. The owner of the Courts retail furniture chain has pumped US$8 million ($960 million) into expanding its distribution centre located off Spanish Town Road. By increasing the site's capacity to handle, store and process inventory by 50 per cent, Unicomer Jamaica will realise tremendous efficiency gains, according to the company's managing director, Dennis Harris. "Having more inventories in one location gives us greater capacity for growth," he told Wednesday Business in a phone interview. "Historically, we have to rent space." The company established its distribution centre in the Three Miles area of Kingston with 30,000 square feet about 15 years ago. 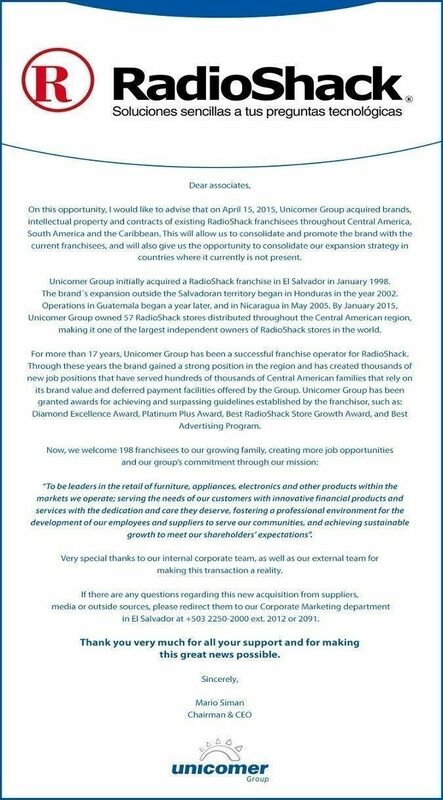 Five years later Unicomer quadrupled the space. The latest addition increased the total square footage to 175,000, or by 35 per cent. However, reconfiguration of older space; the addition of racks which raises the height at which inventory can be stored; and "lots more equipment", such as forklifts, essentially boost capacity by half. "We also created new offices for staff, a spray booth to repair slightly damaged furniture, and a technical service shop which has technicians on hand to assess and fix possible faults in items we have sold," said Harris. The container yard was also expanded just in time for the company's peak season, which sees Unicomer receiving some 65 per cent of the 1,200 containers it handles annually. Unicomer currently has 29 Courts stores nationwide, but the company has seen most of its growth under its five-year old Lucky Dollar brand, which now has 10 outlets. "When we looked at where the market was going, and at the needs of people with lower disposable income, we felt the need for this segment, which has become a lower-cost operation retail business," said the managing director. 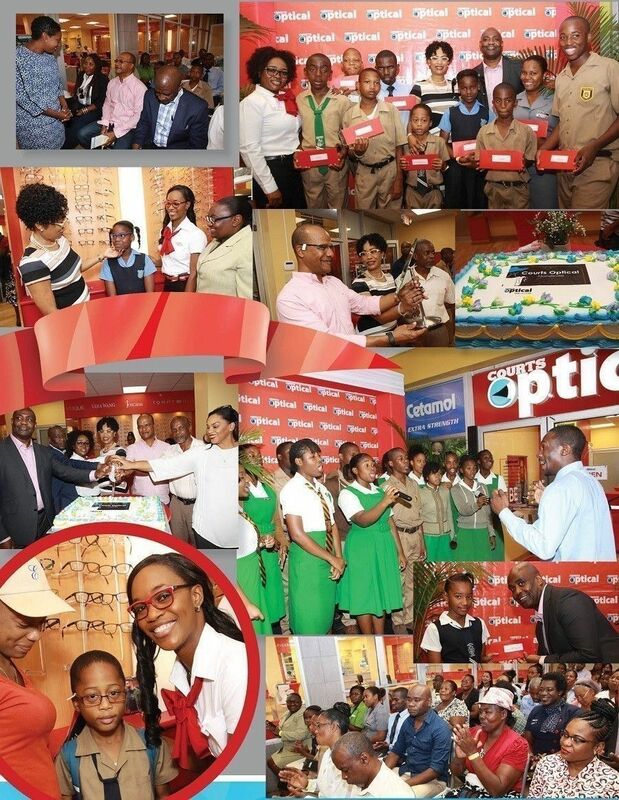 The company also went into optical - eyewear and tested lenses. 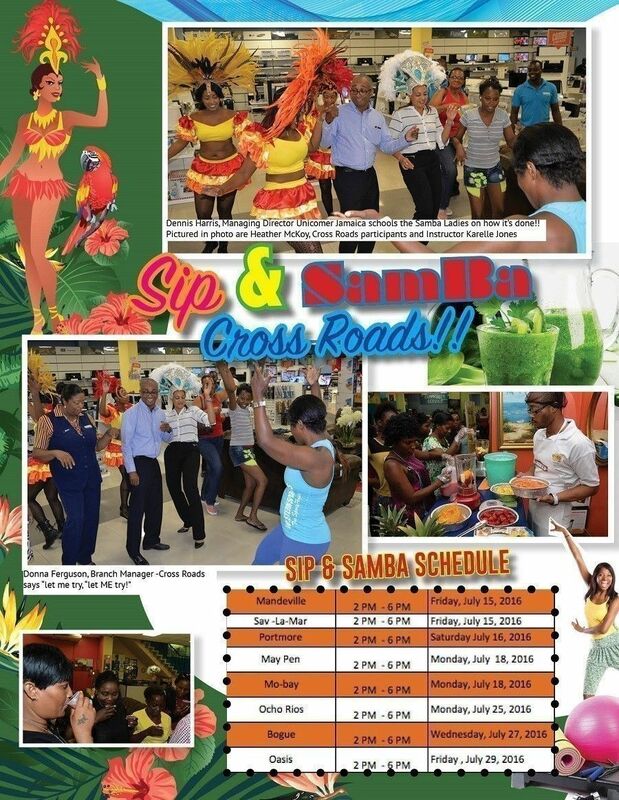 It now has eight stores, while plans to expand this business line are well advanced. For Courts, Unicomer is focusing on enhancing existing stores and improving customer experience, according to Harris. "Given the tough economic environment, we don't see the need to increase the footprint for Courts at this time," he said. An important part of that programme is the installation of LED lighting and solar photovoltaic (PV) systems across select stores. The Constant Spring Road location near Half-Way Tree was the first to see a PV system installed. 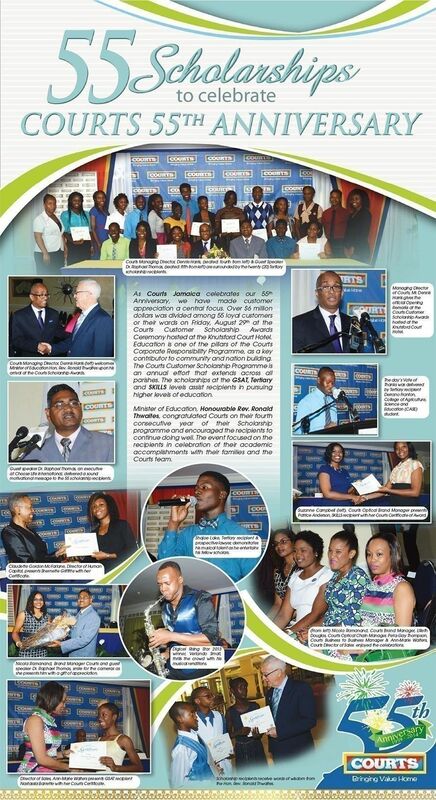 This was followed by May Pen, Portmore and Mandeville. The distribution centre and the Courts store in Cross Roads are also being upgraded with systems expected to be commissioned within a couple of months. Another will be installed at the Linstead outlet shortly thereafter. "On average, we are looking at 65 per cent (electricity) coverage at these locations," Harris said of the PV systems. "Our LED investment is wider - it extends across another nine locations." 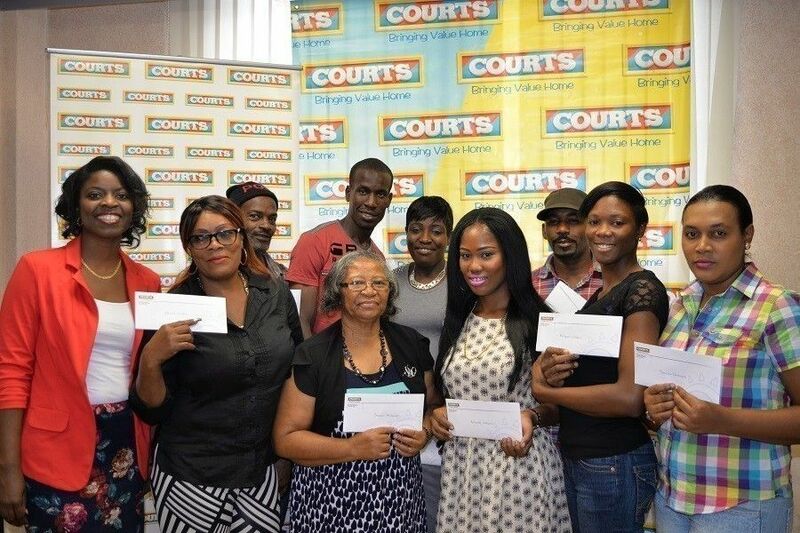 Courts Jamaica made prize presentations for its big summer promotions “Win A Share of $6,000,000” and “TCL Netflix”. 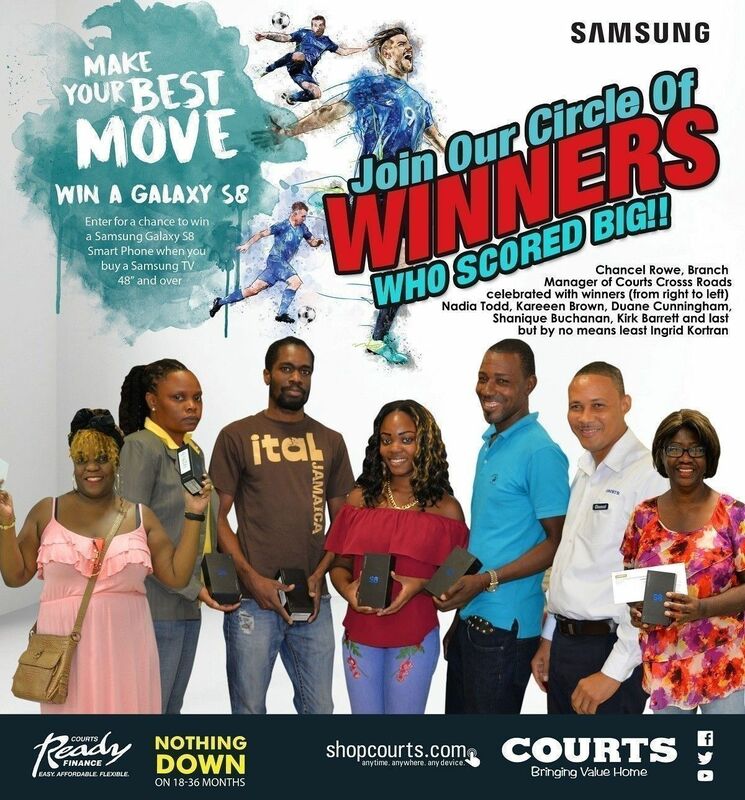 12 lucky customers who shopped at any Courts or Courts Optical store between May 31 – July 4 and spent $10,000 and over inclusive of GCT were eligible for a chance to win $500,000 each. 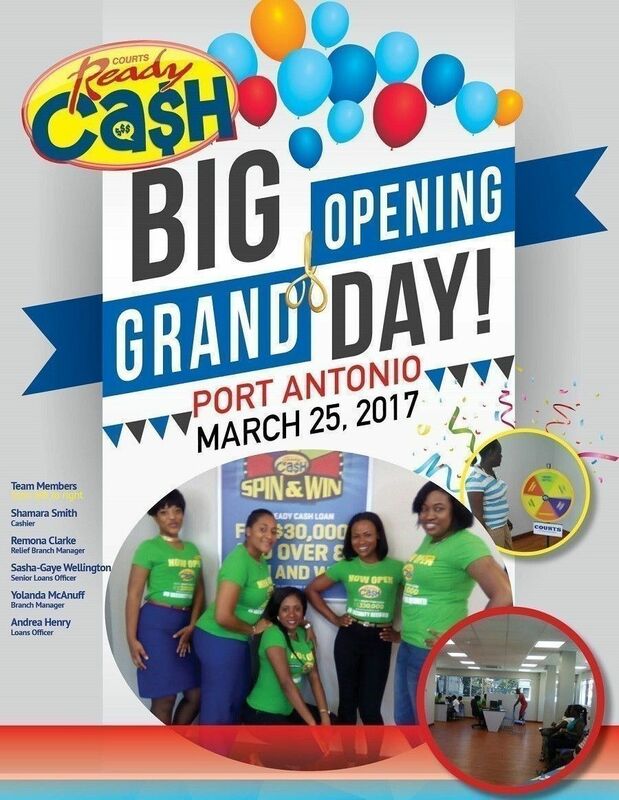 Sandra Johnson, Keneisha Williams, Joanna Foster-Salmon, Richard Lair, Tanecia Cammock, Mollicia Rose, Doreen McDaniel, Evelyn Watson, Gerzel Cooke, Delroy Graham, Lerando Francis and Racquel Wilson were the 12 lucky winners who won a share of $6,000,000. 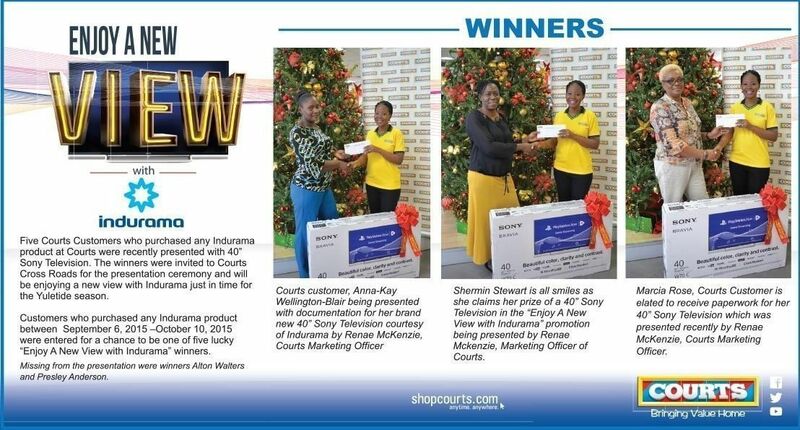 Courts Jamaica Brand Manager, Suzanne Campbell shares in the joy with the ‘Win A Share Of $6 Million Promotion winners. 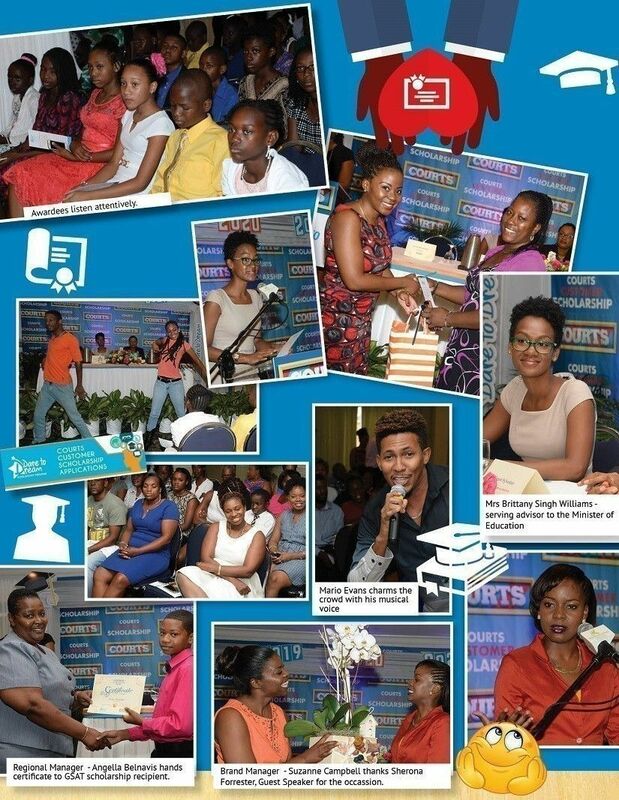 From L-R (Front Row) Gerzel Cooke, Doreen McDaniel, Keneisha Williams, Racquel Wilson, Tanecia Cammock. (Back Row) Delroy Graham, Lerando Francis, Mollicia Rose and Richard Lair. 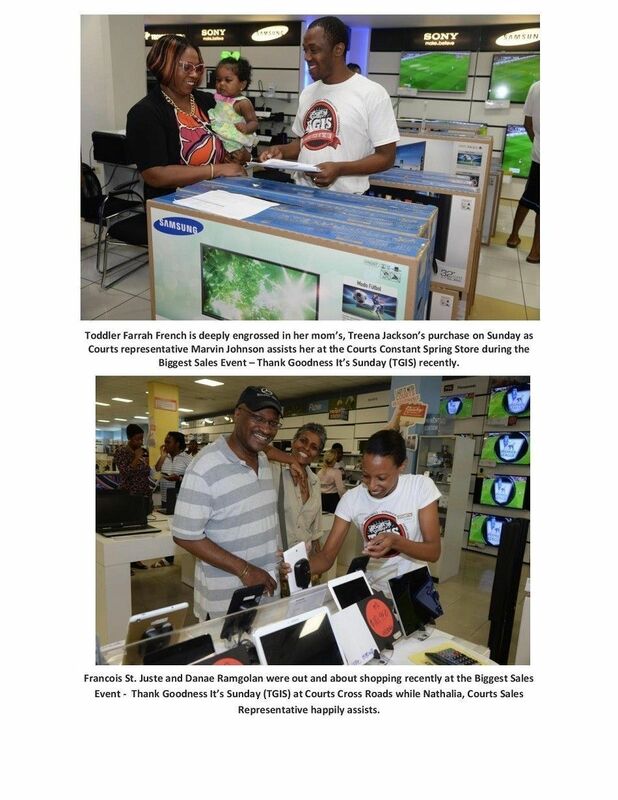 Meanwhile, customers who shopped at any Courts store between May 31 – July 4 and purchased any TCL Smart TV were entered for a chance to win One (1) year Netflix subscriptions. 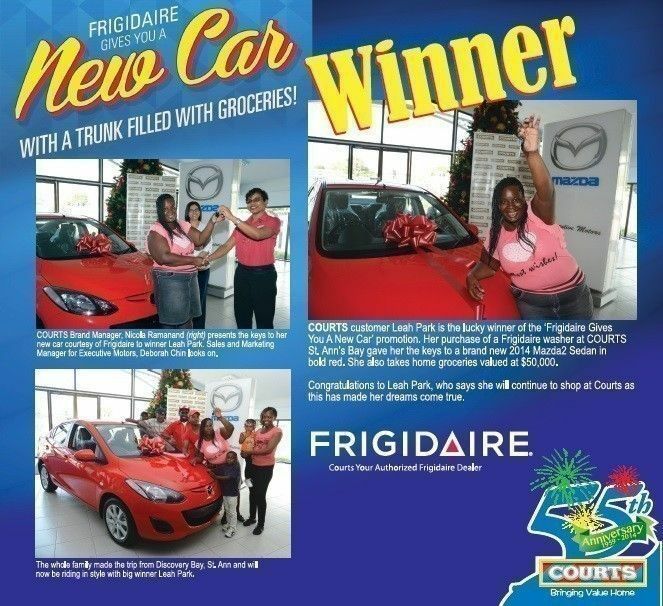 The twenty five winners in this promotion were Edward Wright, Oral Frazer, Anthony Frasier, Ramona Jones, Antoinette Cameron, Donnett Graham, Carol Leslie, Tamieka Smith, Ramone McDonald, Marlon Gayle, Sue- Ann Martin, Sasha Wright, Deborah Jefferson-Minto, Keisha Willie, Carrie Allen, Dowayne Griffths, Fitz Morris, Ian Grant, Heather Roberts, Sharon March-Richards, Shereen Meghoo, Gerton Robinson, Andrienne Todd, Stacy-Ann Ellis and Ivanhoe Nonko. 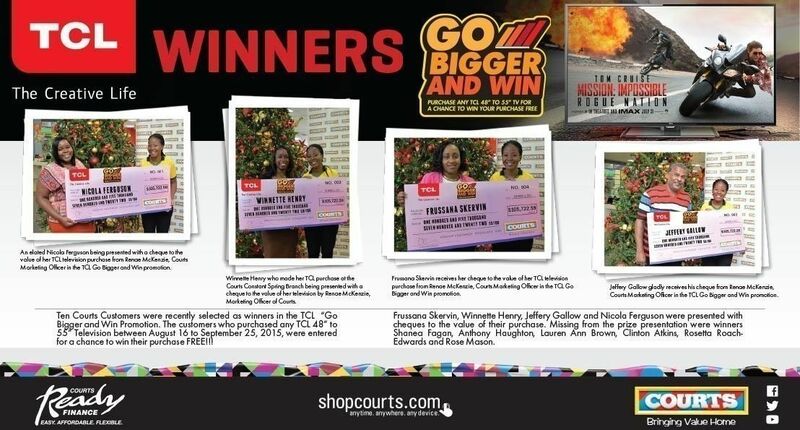 Suzanne Campbell, Courts Jamaica Brand Manager is pictured here with the winning ‘TCL Netflix’ Promotion winners Sharon March-Richards, Edward Wright and Deborah Jefferson-Minto. 25 Courts customers won One (1) year Netflix subscriptions in this promotion that ran from May 31 - July 4. Kevin Brown, Warehouse Assistant at Courts Jamaica, is hard at work nailing the new roof of a house built to benefit a needy family in St. Ann. 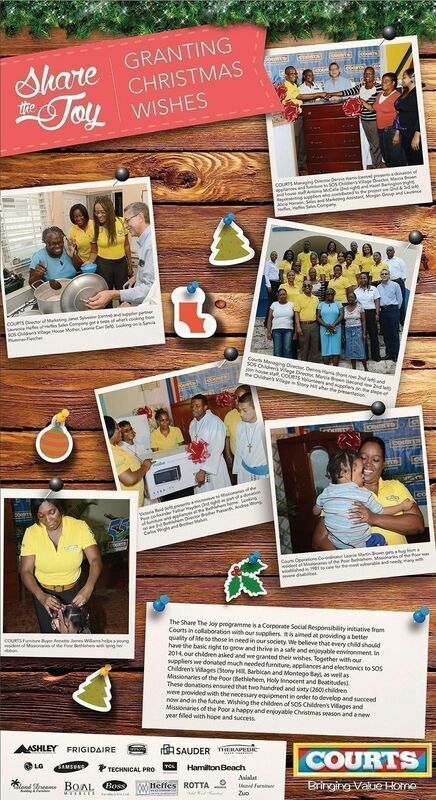 Brown was a volunteer as part of Unicomer Jamaica's corporate social responsibility partnership with Food for the Poor to buil 12 homes islanwide. 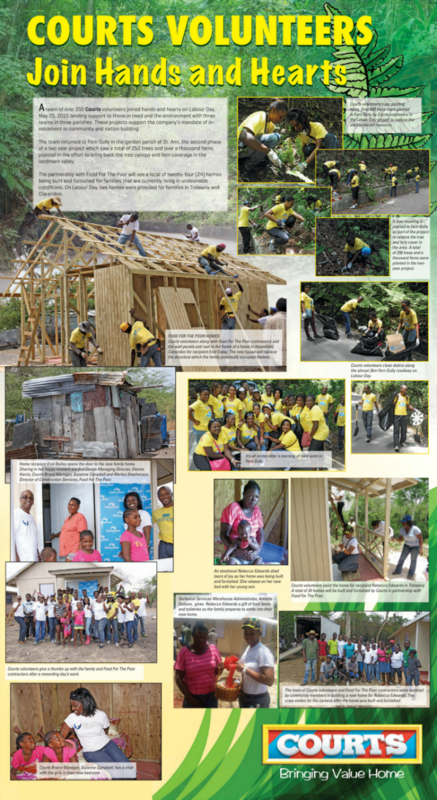 True to its mantra of 'bringing value home', Courts Jamaica volunteers worked assiduously every Friday in August to build four homes in collaboration with Food For The Poor (FFP). The retail furniture and appliance provider mobilised more than 100 staff members to construct housing solutions to support needy families living in undesirable conditions. As an important part of its mandate to support nation building, the company has a keen interest in community development and, to date, has assisted with building six of a 12-home partnership with FFP to be completed by March 2016. 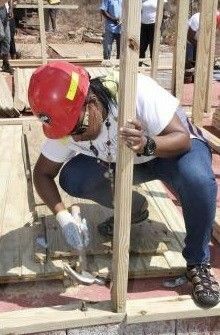 [Picture Right]- Kaysia Mitchell, Administrative Assistant at Unicomer Jamaica, shows she is not afraid of hard work at the recent house building for a needy family. "Courts has been a part of the lives of Jamaicans since 1959 and we recognise and value the contribution each person has made to our success. 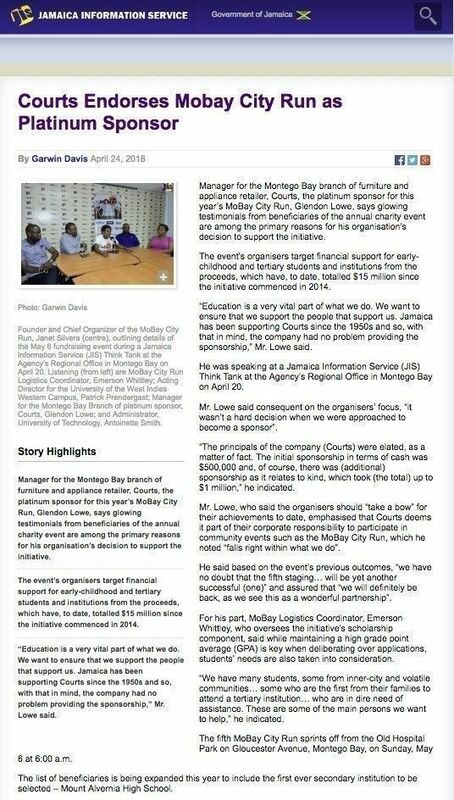 We want to continue to support the people and the communities we serve," said Dennis Harris, managing director of Courts Jamaica. On Labour Day, two homes were built and furnished for families in Trelawny and Clarendon, while in August, homes were built in St Thomas, St Ann, Westmoreland and St Catherine. The needy families all had intriguing stories. A client of the Victim Support Unit who suffered abuse at the hands of her husband, which almost claimed her life, became the sole provider for three children and experienced tremendous difficulties maintaining a place to live. The construction of her home made a big difference in their lives and provided well-needed assistance. A St Ann mother of five living in a derelict, one-room, board structure received a new lease on life with the improvement of her living conditions. The home also alleviated the hassle of severe overcrowding. In Westmoreland, a family of nine was able to move from their termite-infested dwelling that had a leaky roof and poor sanitary conveniences. A single mother of four children, one of whom is mentally ill and requires supervision, was living in a dilapidated structure that was beyond repair. Marsha Burrell (left), Development/Marketing Manager at Food For the Poor anf Carren Royal (right),Executive Assistant and corporate social responsibilit co-ordinator, celebrate with Denise Russell as she opens the door to her new home. The homeowners all expressed their gratitude for the comfortable dwellings comprising two bedrooms, a bathroom, kitchenette and a patio, with furnishing of beds, a combination chest of drawers and dresser. The handover of keys was a special moment for these families and the volunteers. COURTS/UNICOMER recorded their 13th straight win by beating Sagicor Group 'B' 34-32 as the 2015 3-on-3 Business House Basketball Association (BHBA) Division One and Two Leagues continued at the Stadium Basketball Courts last Monday night. The Courts aggregation also became the only unbeaten team in both leagues. Courts are currently competing in the Division Two League where they have topped the points standing with maximum 26 points. Coached by Dave Smith, Courts have returned to the competition in 2012 after a few years' absence. So far Smith figures that he can go all the way and maintain their unbeaten run to the end. He said, however, despite his unbeaten run in the preliminary round they still are not yet out of the woods as their last two matches against Urban Development Corporation (UDC) and Sagicor Group 'A' went down to the wire. "We beat UDC in sudden-death shoot-out after the game had gone into overtime where the scores were still tied, while against Sagicor 'B' we just managed to score before the buzzer from a two-pointer shot," Smith said. Smith said he does not know who he will be playing in the one-off quarter-final knockout encounter as there is an interesting tussle for the remaining quarter-final spots between at least four teams in the Division Two League. "I am, however, very confident that Courts/Unicomer can win the Division Two League title as we have the strategy and formula and the players to do it. Our plan was to not lose any games and, providing no deviation of the team, we should win," said Smith, who will be looking for tougher games in the quarter-finals, best-of-three semi-finals, and best-of-five finals to come. Courts/Unicomer will now have to wait for matches which were postponed to be completed before knowing their opponents in the quarter-finals knockout format. Sagicor Group 'B' are in second place with 23 points, having completed their round of matches, while the other teams who are in search of a place in the quarter-finals are Aeronautical (AEROTEL)/Jamaica Civil Aviation Association (JCAA) with 22 points. Urban Development Corporation (UDC) with 22 points from 13 games; CARIMED Limited with 20 points from 12 matches; Industrial Commercial Development with 19 points from 12 starts; PEPSI Jamaica Limited with 19 points from 12 games; Jamaica Urban Transit Company (JUTC) with 18 points from 12 games. Results of matches played in the Division Two League last Monday evening: Courts/Unicomer got past Sagicor Group 'B' 34-32; Jamaica Money Market Brokers clipped UDC 28-27; JNBS got the better of Continental Baking Company 25-22. Results of matches played in Division One League last Monday evening: NHT defeated Bank of Jamaica 34-28; Sagicor Group crushed Victoria Mutual Building Society 66-35; Police outscored National Commercial Bank 32-20; Accent Marketing got the better of Digicel Group 26-21. 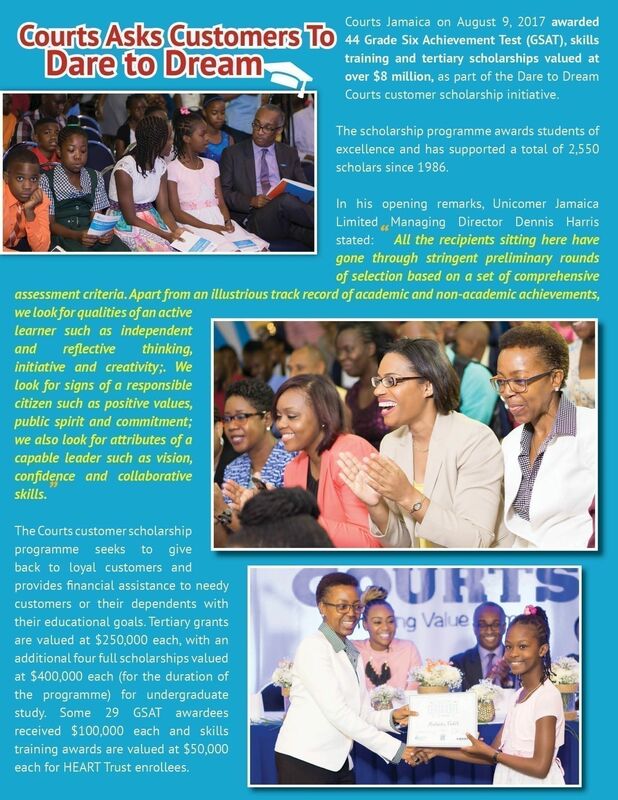 Last Thursday, Courts Jamaica handed out its 2015 Customer Scholarships at the Knutsford Court Hotel in St Andrew. 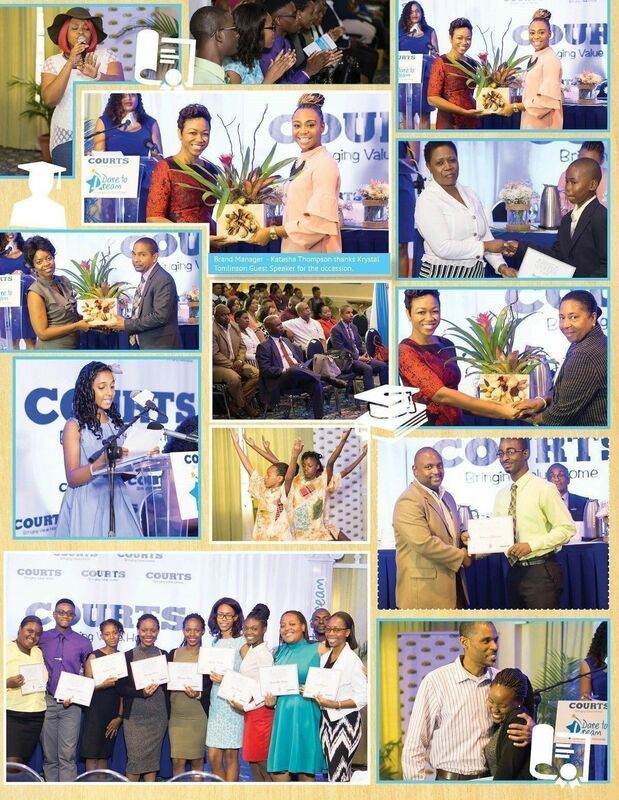 The 43 recipients comprise Grade Six Achievement Test scholars heading into high school, tertiary-level students and skills training students. 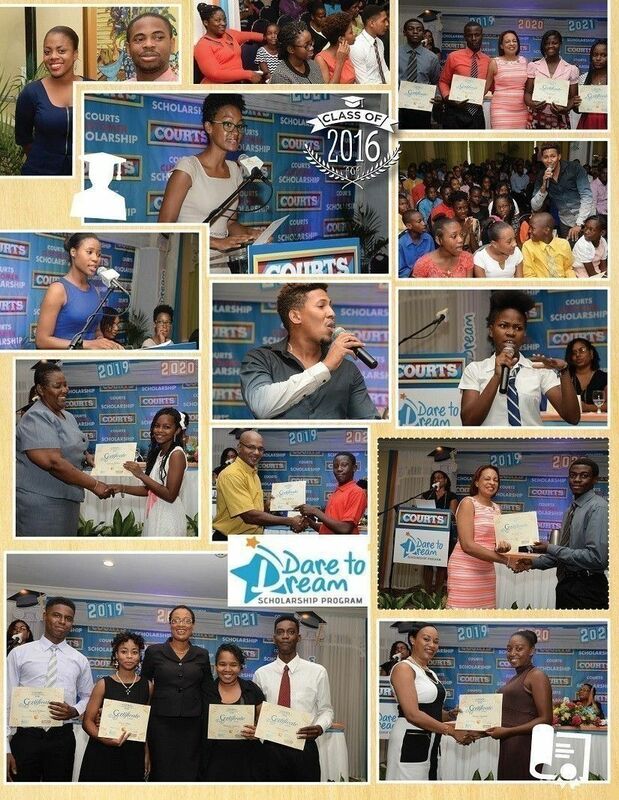 The scholarships valued in excess of J$8 million. 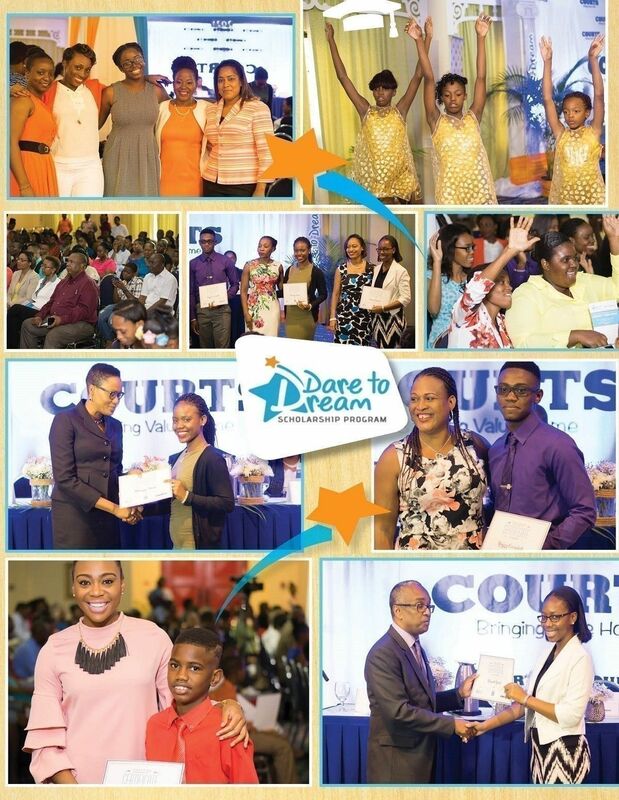 Managing Director of Courts Jamaica, Dennis Harris, encouraged the recipients to make the sacrifices needed to get the outstanding results. "Society invites us to pursue instant pleasures, fast bursts of joy and quick hits of feeling good," he said. "However, there comes a moment in every life, including yours, where the chance appears to leap from ordinary to legendary, from average to epic and from normal to iconic. This time is today." He reiterated Courts' support of youth by investing in education and challenged the recipients to seize the opportunity. "It's untrue that top achievers are born with gifts that you do not have," he said. "And buying into that idea is a great way to avoid doing the work you need to do to enjoy the success you deserve to have." 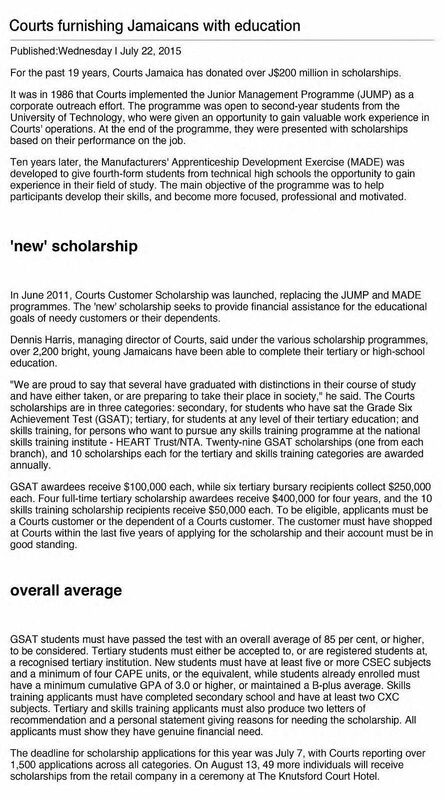 The Courts Customer Scholarship was launched in June 2011 and replaced the two former scholarship programmes - Junior Management Programme and Manufacturer's Apprenticeship Development Exercise. The programme provides financial assistance to needy customers, or their dependents, with their educational goals. Scholarship applications open in June and close in July annually. This year, the tertiary students will work with mentors who are senior managers of the Courts team. 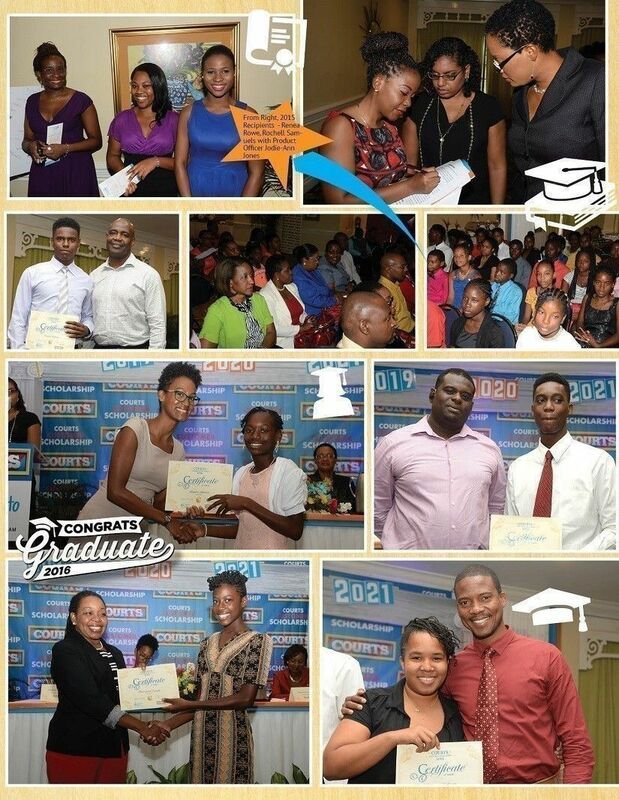 Ricardo Allen, managing director and founder of One-on-One Educational Services Limited, told the scholarship recipients about his struggles as he came through the education system, even having to work to send himself to school. "Privilege is such an awesome thing in life, we don't determine how we get into this world," he said. "You, however, have a say in what you do while you're here." Allen warned them that there were going to be times when their backs would be against the wall and so the only way to fight back, was to go forward. "That level of thinking is imperative, I think, to go through life," he said. "Because what it does is to give you that frame of mind that 'look I have to get out'." Allen shared some of the obstacles he faced in trying to get an education, and noted many of his fellow students were much better off financially. But he expressed gratitude for the scholarships he received that helped him achieve his dream. 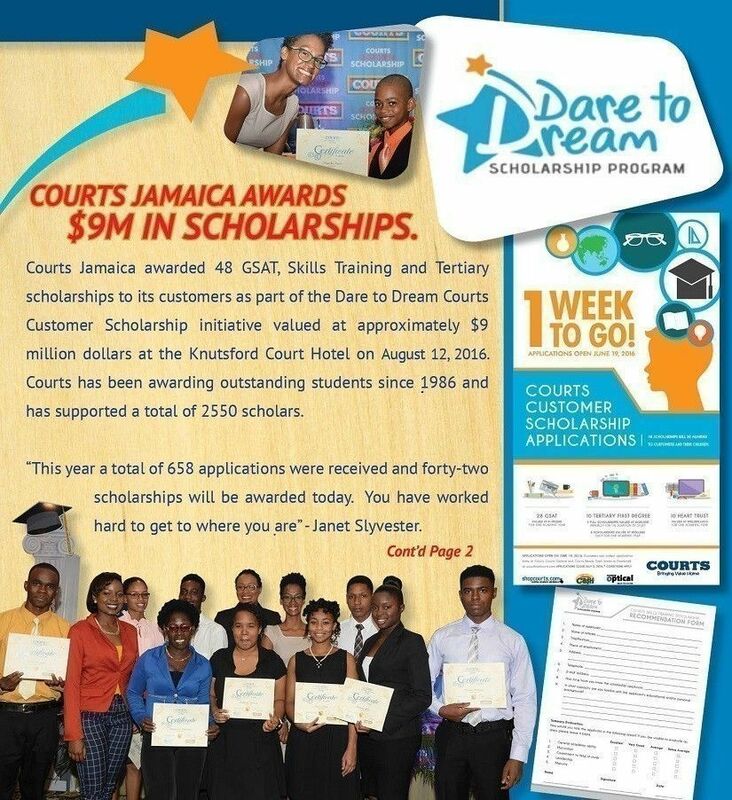 "This opportunity that you all have today, by you getting funding from a corporate entity such as Courts, is leveling the playing field," he said, reminding them there was one semester he got a less than 30 per cent average. "If you today are getting more than 28 per cent average...you have absolutely no excuse. None whatsoever." 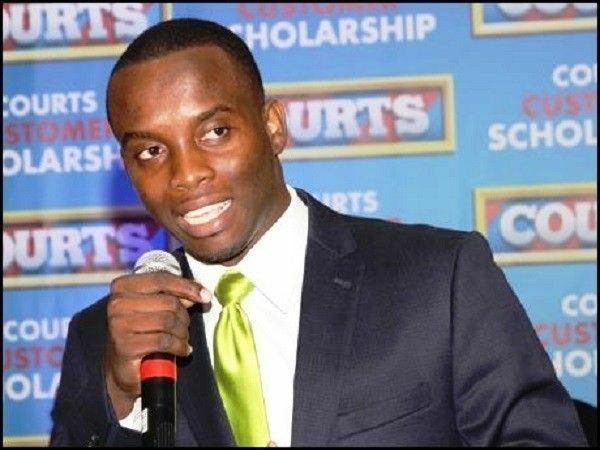 Former scholarship recipient Romain Thompson, who is from humble beginnings in Clarendon, and is now working at PriceWaterhouseCoopers, encouraged the scholarship winners to have a long-term vision. "The most important thing is to always, every day, improve yourself," he said. "Set that bar higher every single time." Claudette Gordon-McFarlane (right) was excited when she was picked to mentor Abigaile Hall during the Courts Customer Scholarship Awards Ceremony at the Knutsford Court Hotel, St Andrew, last Thursday. 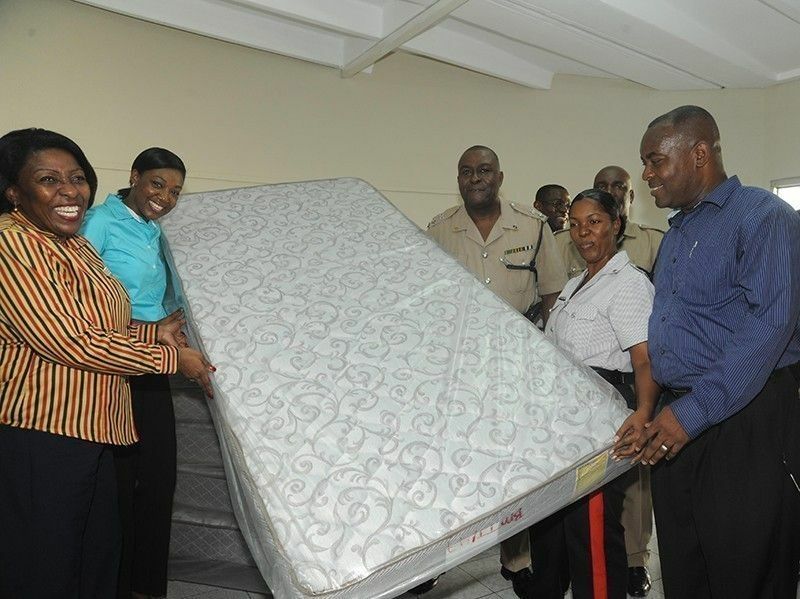 Courts Portmore Branch Manager Marjorie Daniels (first left) and Courts Public Relations Officer Michelle-Ann Letman (second left) hand-over one of 20 mattresses to Senior Superintendent of Police Ronald Anderson and Sergeant Hillary Jones of the Greater Portmore Police Station St. Catherine South Division. Also participating in the hand-over is Acting Mayor of Portmore His Worship Councillor Leon Thomas (first right). 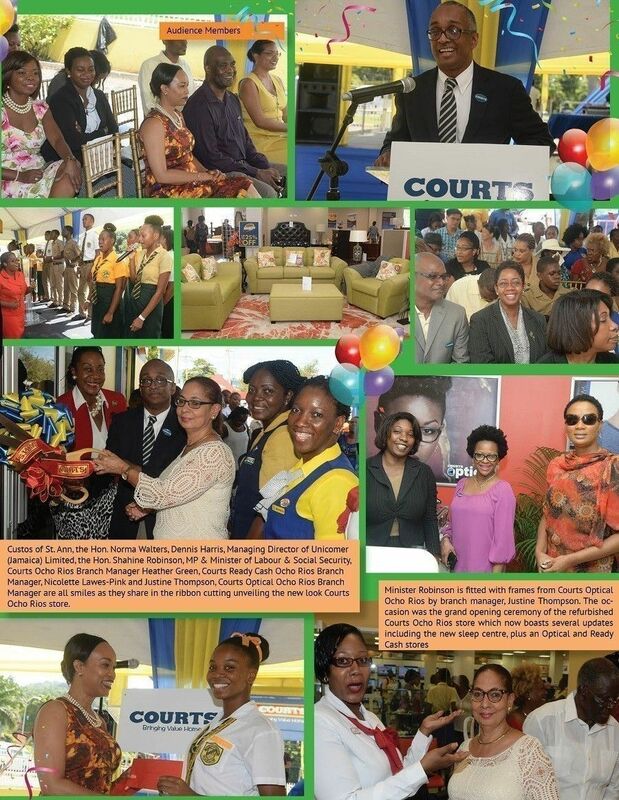 Courts Jamaica Celebrates its 55th Anniversary! 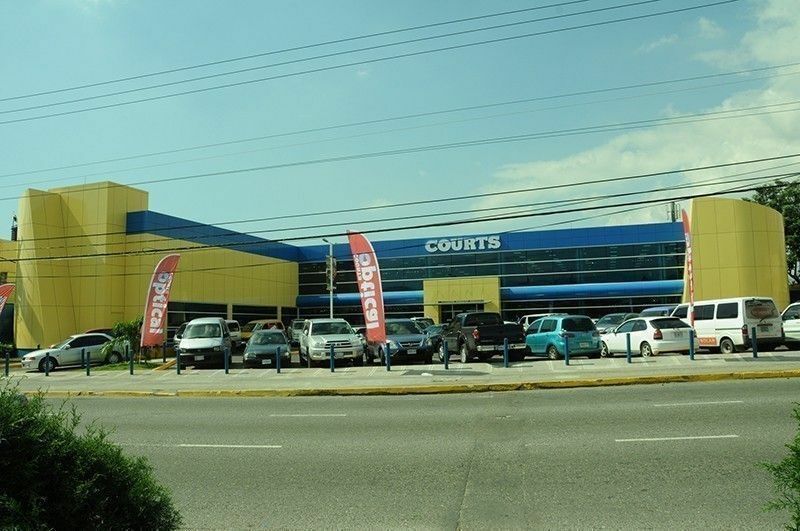 Courts Jamaica, the Caribbean’s largest furniture and appliance retail giant will be celebrating its 55th anniversary this year with its birthday on May 15. The leading furniture company was first brought to Jamaica by the Courts brothers, who came from the United Kingdom and opened the first store in Cross Roads, Kingston on May 15, 1959. 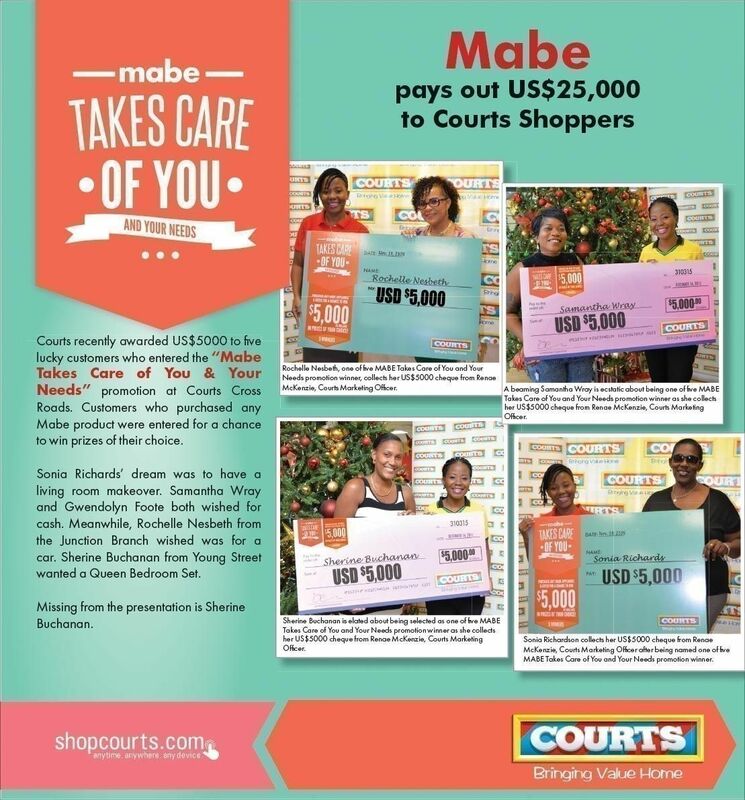 Since then the company has significantly increased its operations and has grown in number and size with 29 Courts stores spread across the 14 parishes of Jamaica. The company changed ownership in December 2006 and is now owned and operated by Regal Forest Holdings (RFH) under the Unicomer Group. 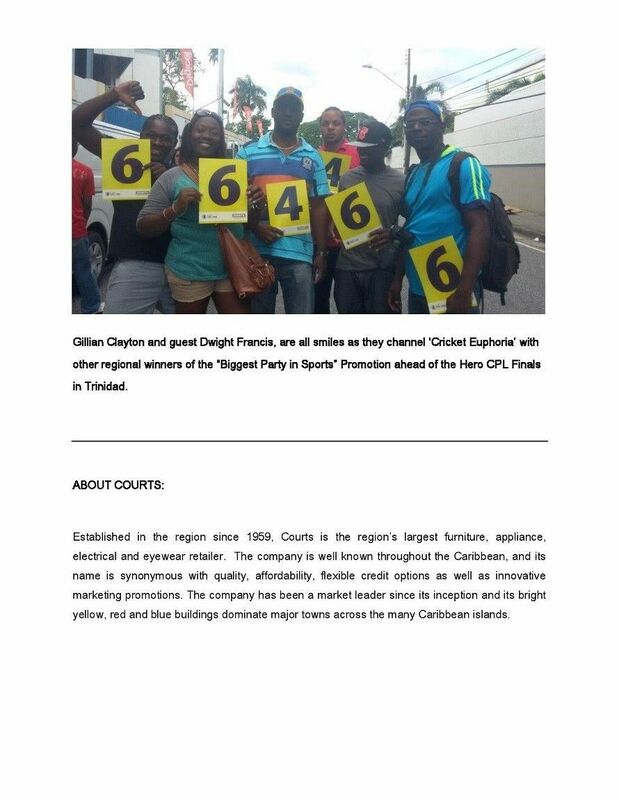 Over the past 54 years Courts has been an integral part of the lives of Jamaicans; the company consistently strives to offer Jamaicans the best in furniture and appliances and has sought to make home furnishings more affordable for its customers by always improving its easy, flexible and convenient credit plan. 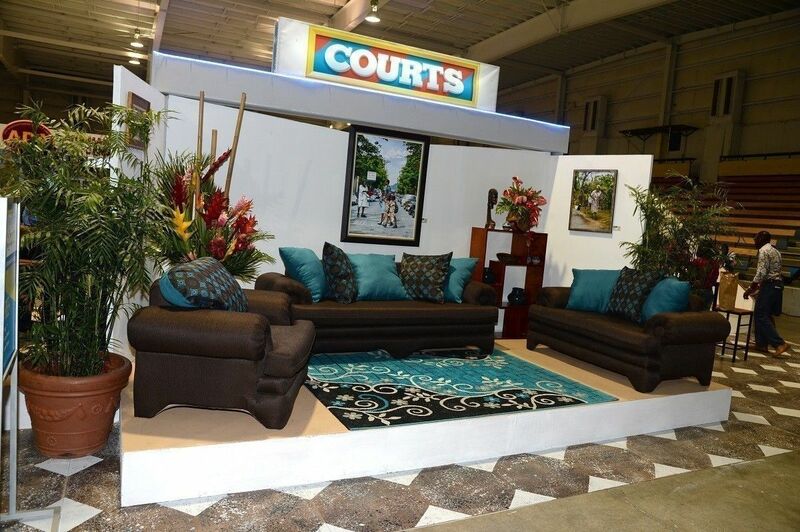 Courts credit facility has afforded hundreds of thousands of Jamaicans – from generation to generation - the chance to furnish their homes with beautiful, comfortable, affordable and quality furniture and appliances. 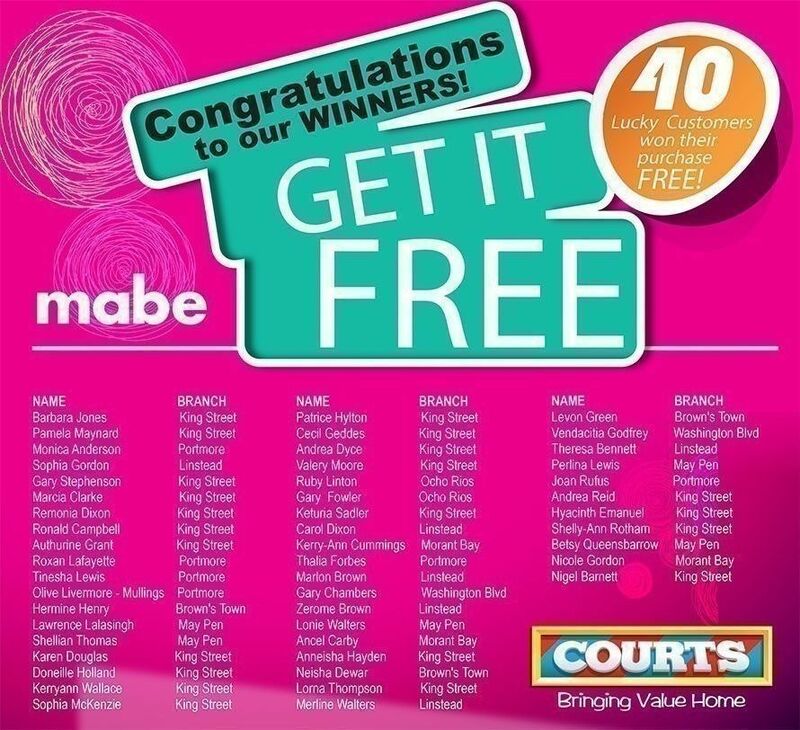 Courts has not only revolutionized the furniture retail industry but has been an innovator and trendsetter over the years creating waves with its flamboyant and stimulating marketing sales promotions, impressive prizes and giveaways, creative advertising and a well structured public relations campaign. 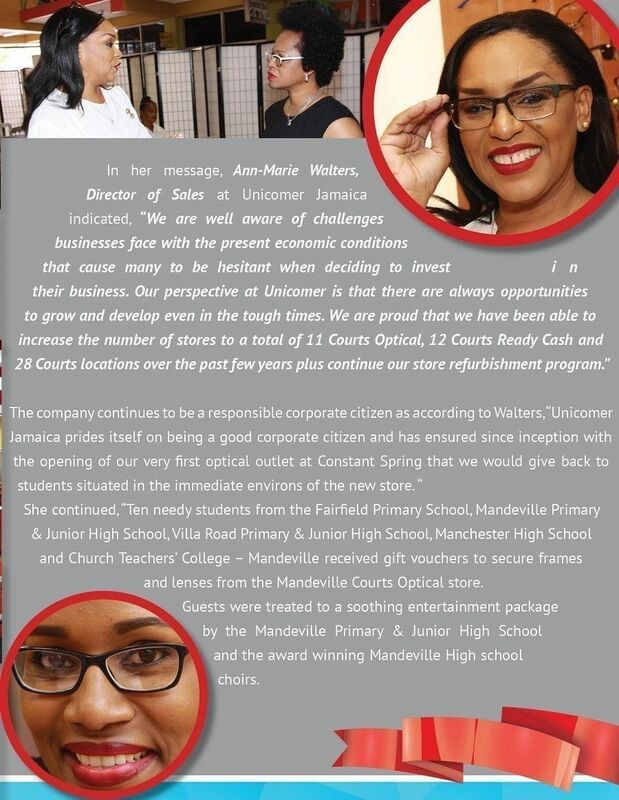 Always wanting to bring value to its customers and explore new business opportunities, Courts ventured into the eyewear business in November 2012 when it opened its first Courts Optical store at its flagship retail Courts store at Constant Spring road. 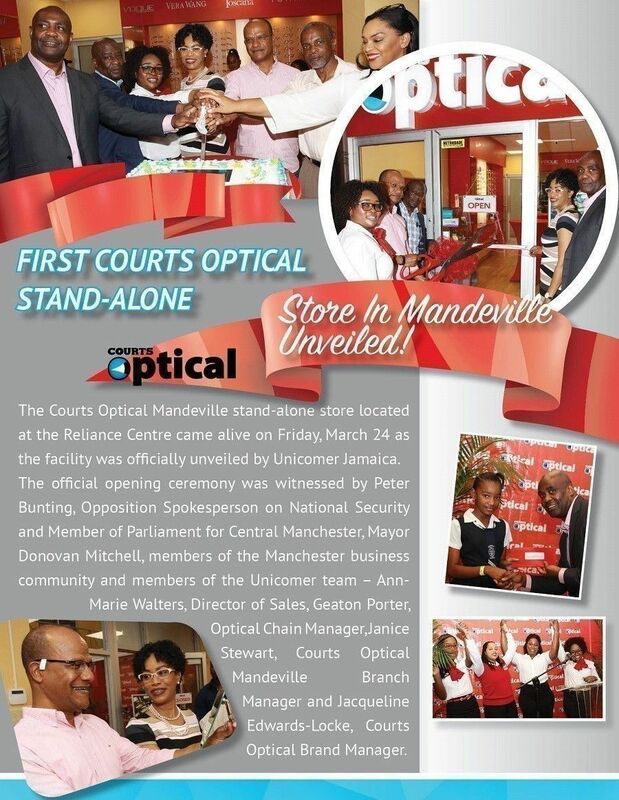 Since that opening the company has opened four more Courts Optical stores at its Courts Cross Roads, Portmore, Oasis – Spanish Town and Bogue – Montego Bay stores. Courts Optical offers full service optical solutions to customers with free eye testing, filling prescription, in-house doctors, prescription lenses and contact lenses, frames and fashion contact lenses. 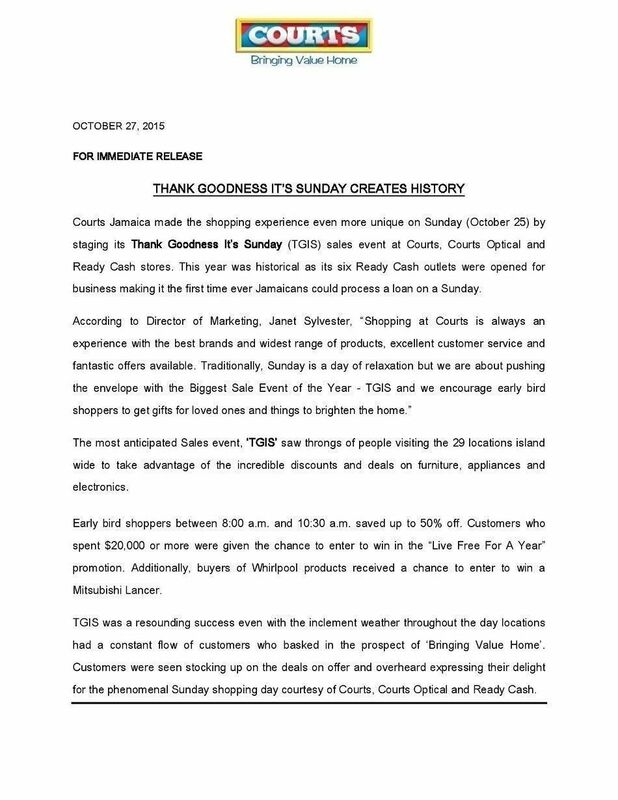 Courts is a strong household name in Jamaica and spreads across the diaspora and its name echoes sentiments of longevity, quality and affordability. To celebrate its remarkable milestone – its 55th anniversary – the company will be having several exciting activities throughout the year. 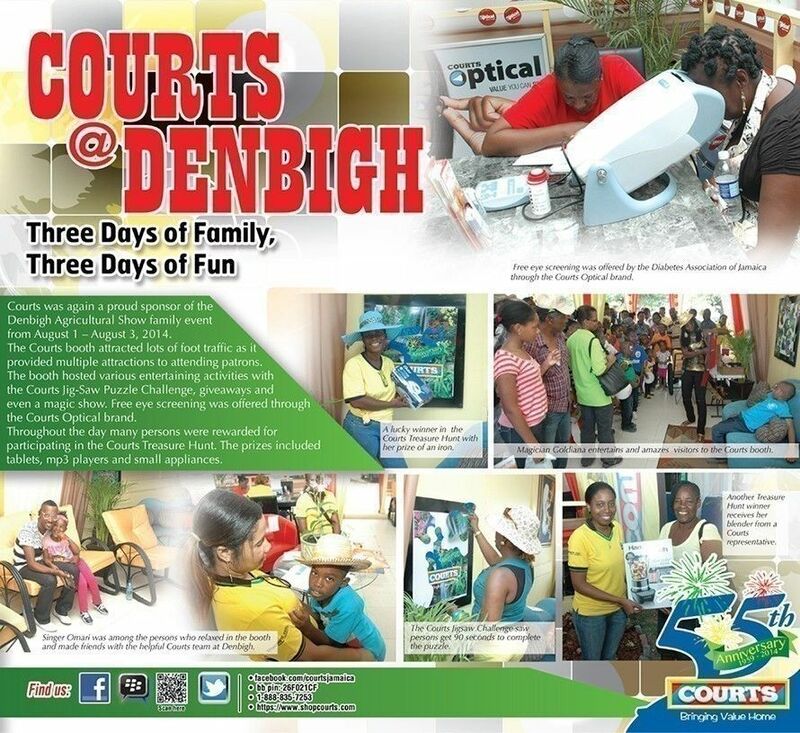 Courts Constant Spring, the company's flagship store. 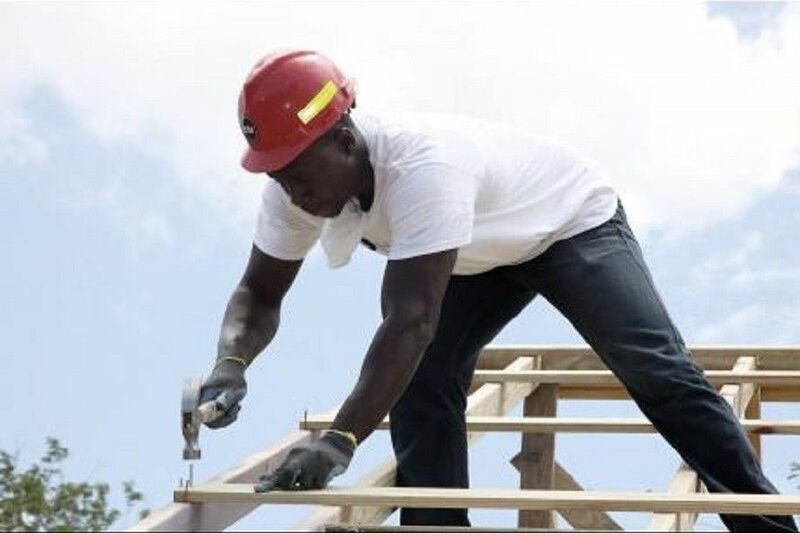 Kevin Brown, warehouse assistant at Courts Jamaica, is hard at work hand nailing the new roof of a house built to benefit a needy family in St Ann. 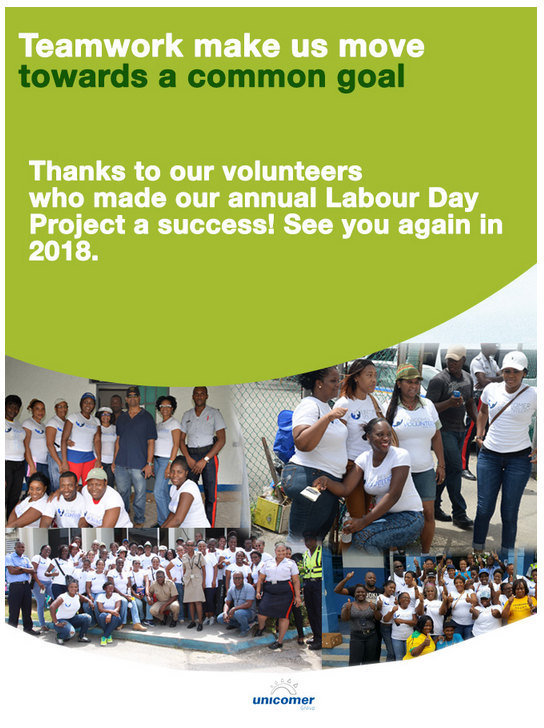 Brown was a volunteer as part of Unicomer Jamaicas corporate social responsibility partnership with Food for the Poor to build 12 homes islandwide.